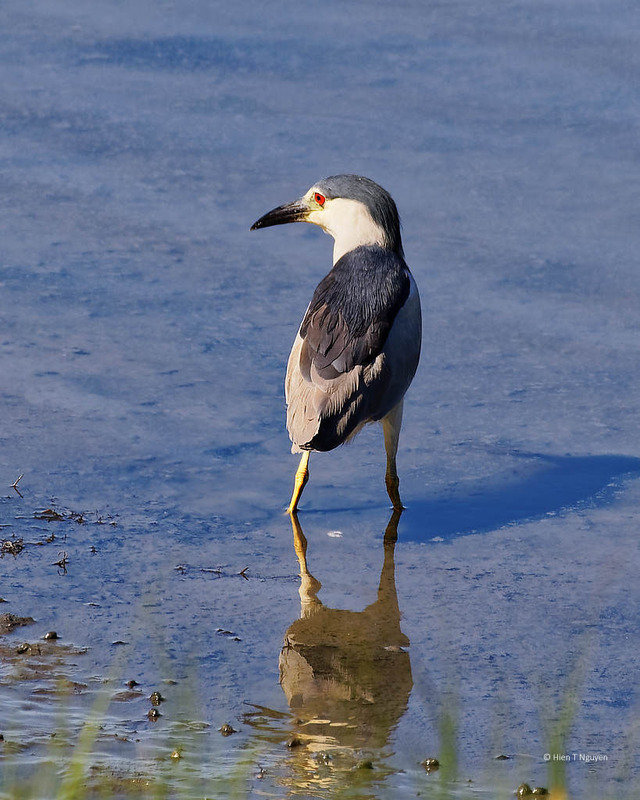 Two weeks ago, while the paparazzi were clustered around a nest with new chicks, I saw a Black-Crowned Night Heron fly to the marshes at low tide. 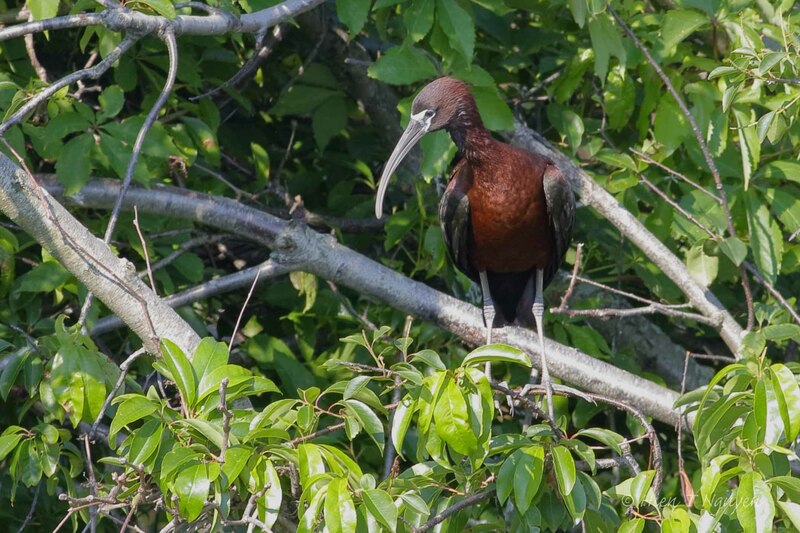 These birds, as their name implies, normally feed in the evening, but this one was going to have lunch by pulling out worms from the sand. 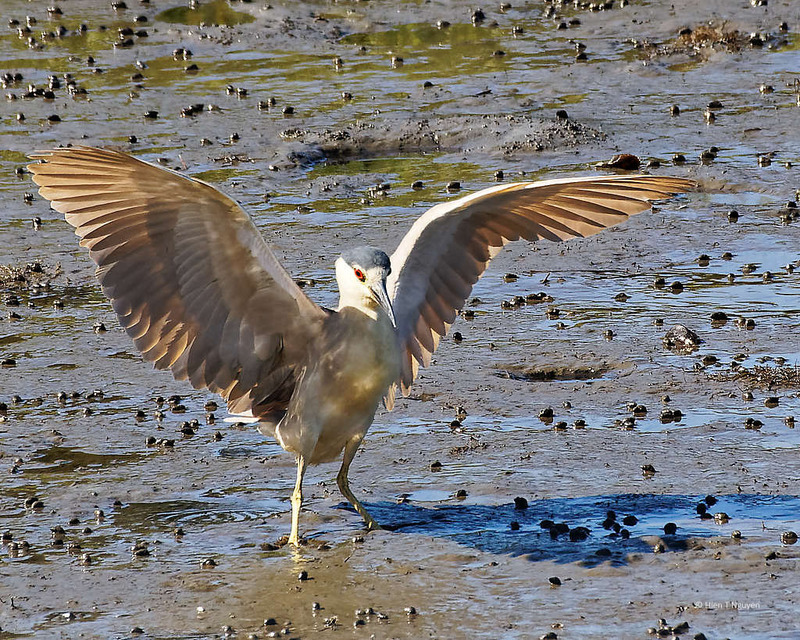 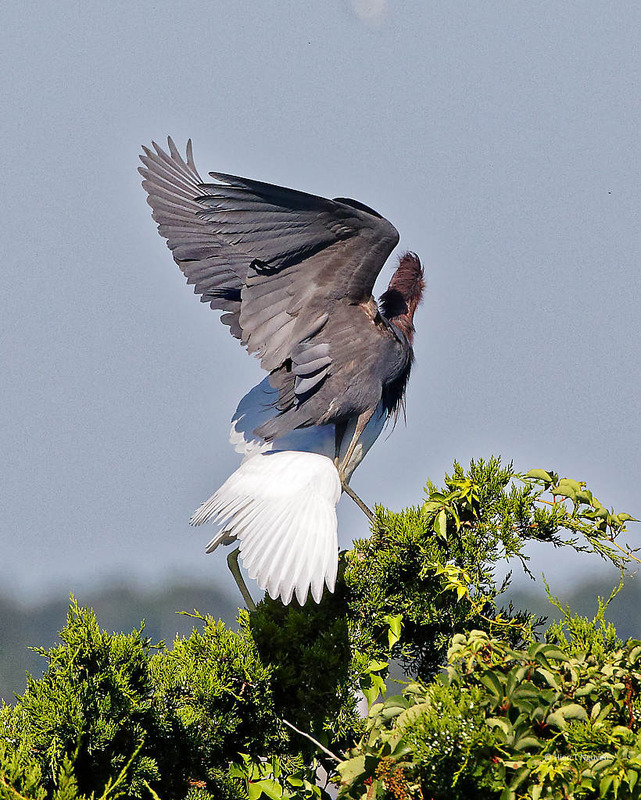 Black-Crowned Night Heron landing on marshes. 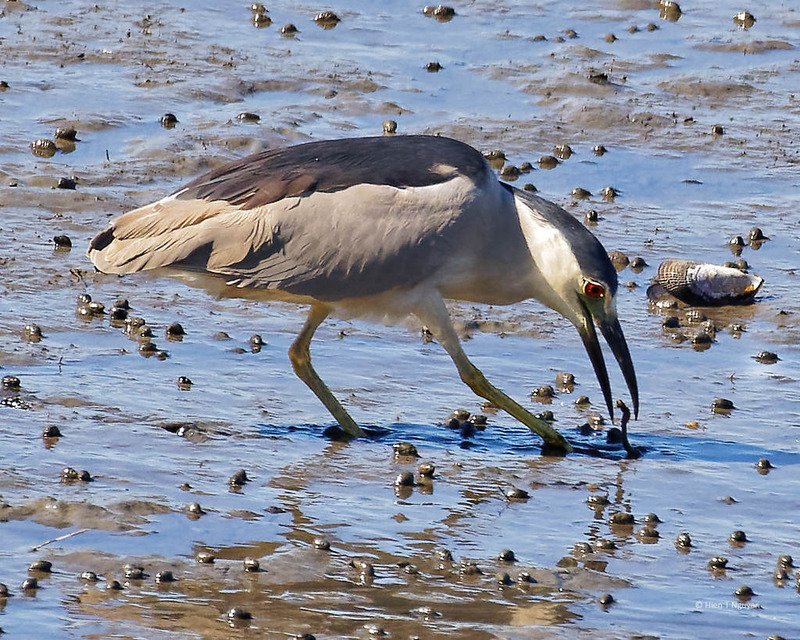 Black-Crowned Night Heron catching sand worm. 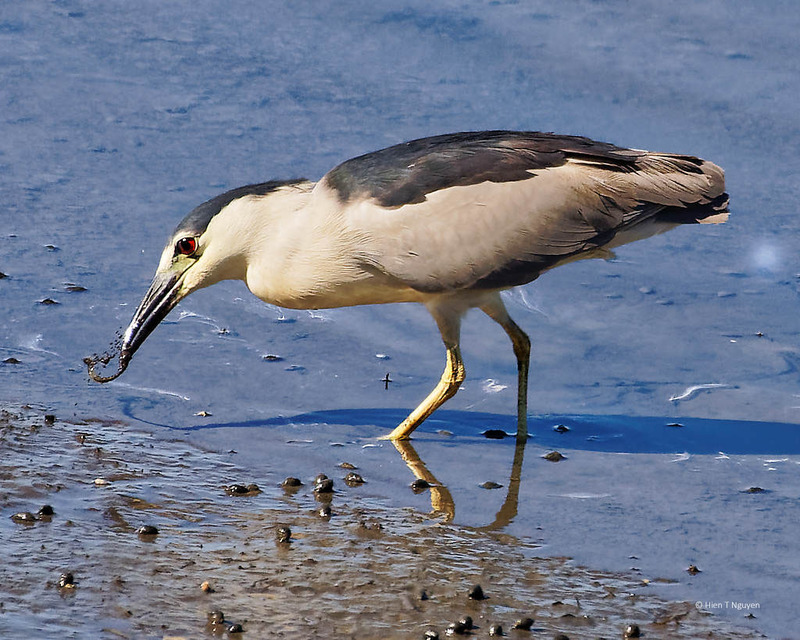 Black-Crowned Night Heron eating sand worm. 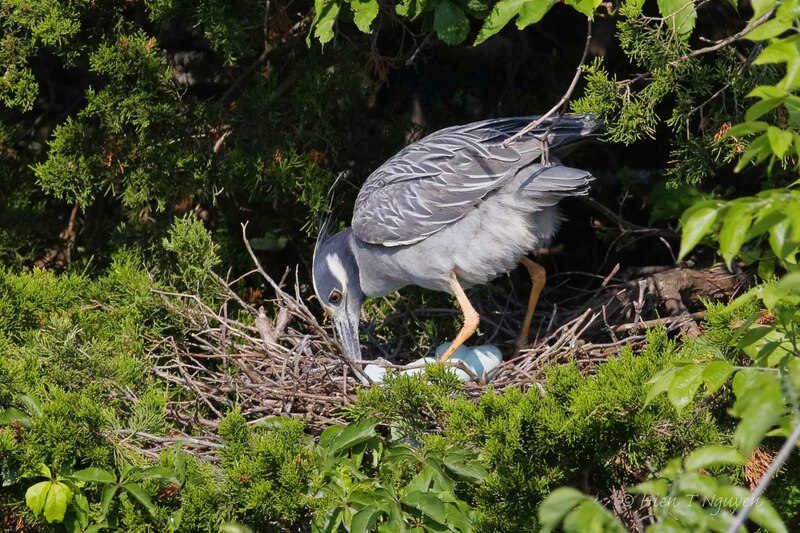 The heron ate at least half a dozen worms. 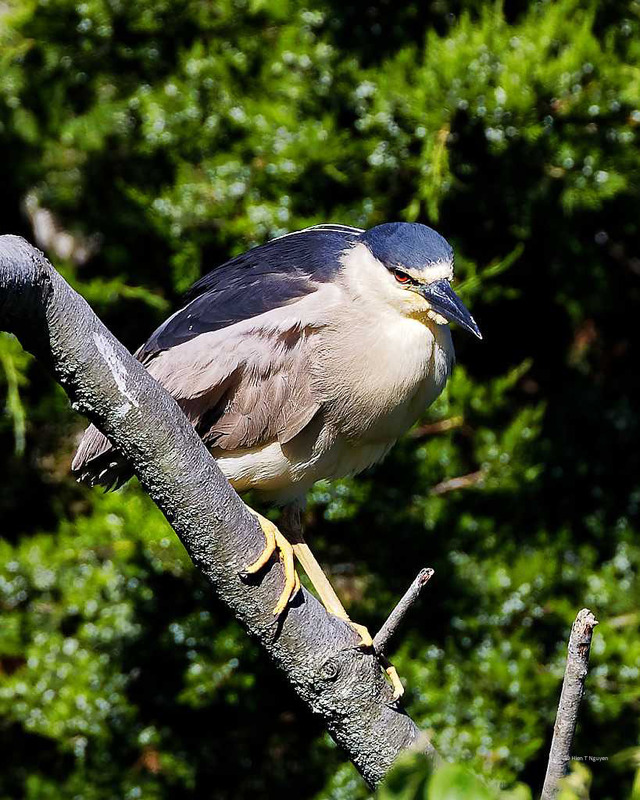 Black-Crowned Night Heron posing one last time before flying back to the rookery. 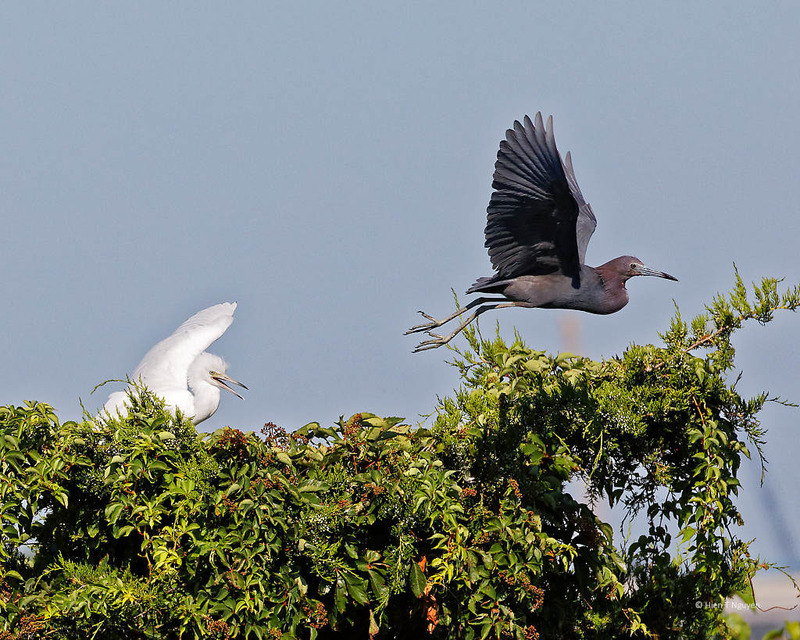 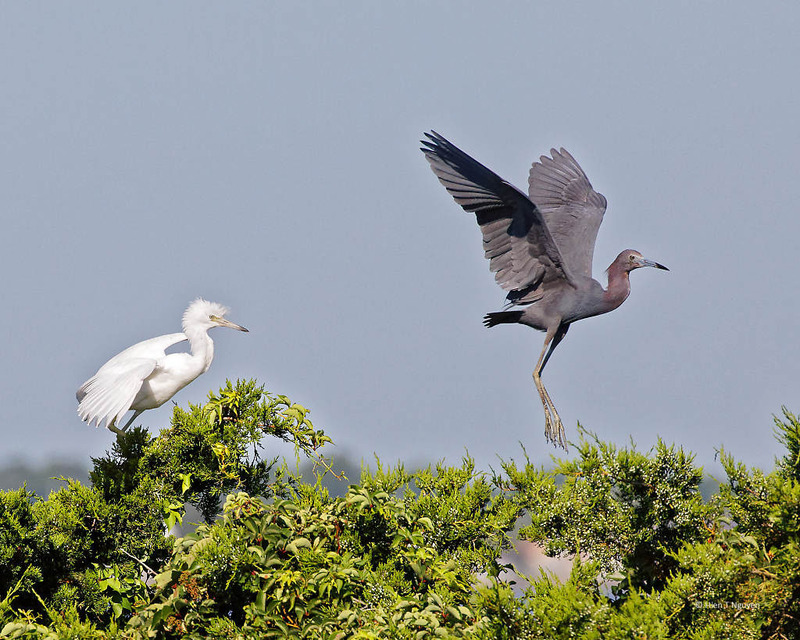 At the rookery next to the Welcome Center at Ocean City, NJ, I saw a Little Blue Heron and its juvenile child. 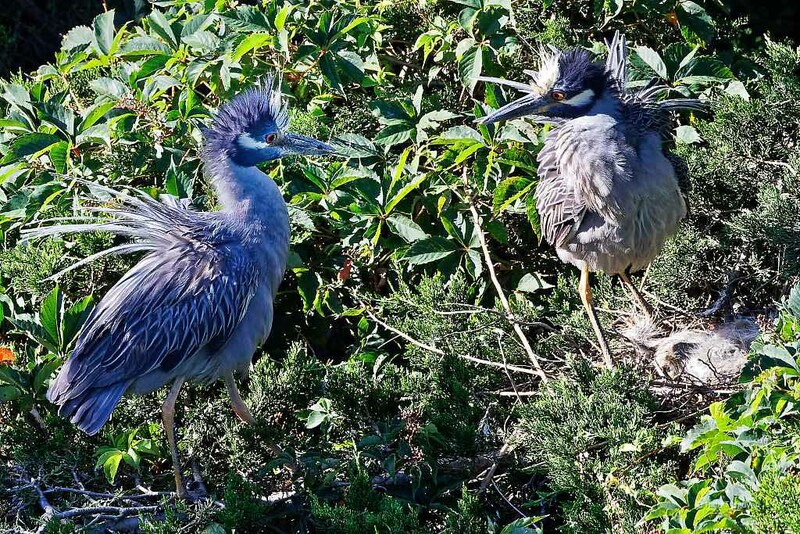 Their colors confused me at first. 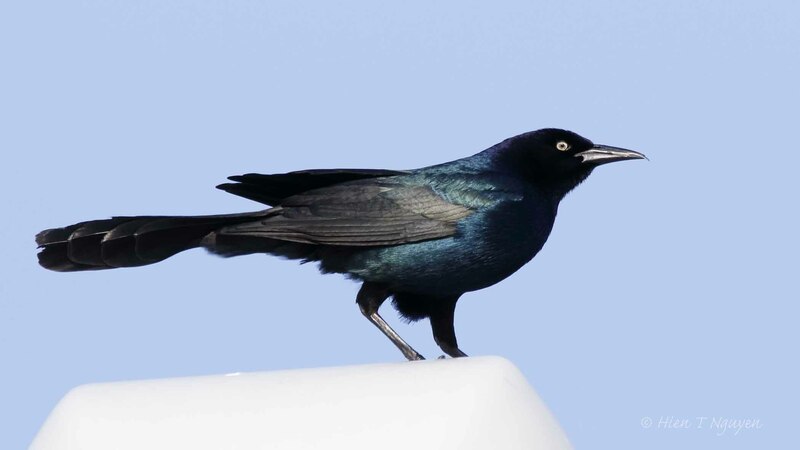 Juveniles are white, while adults are deep blue and purple. 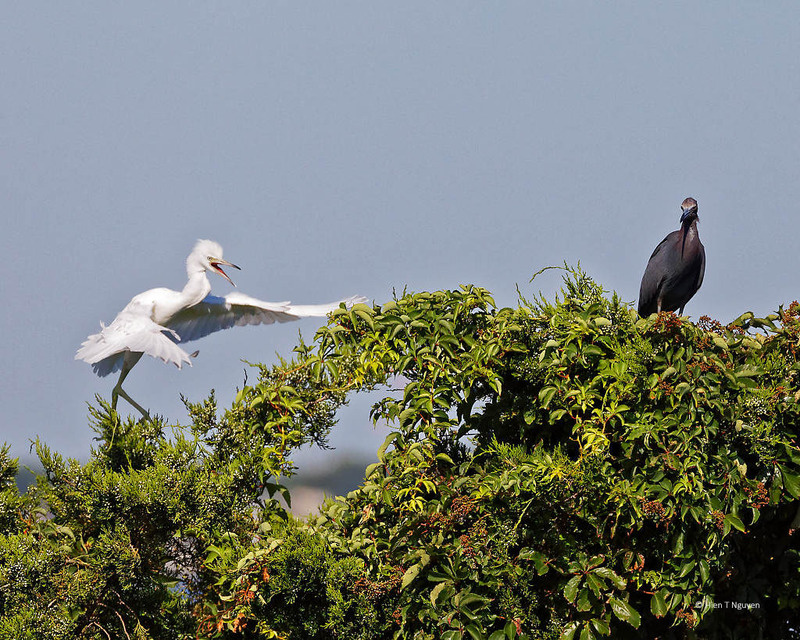 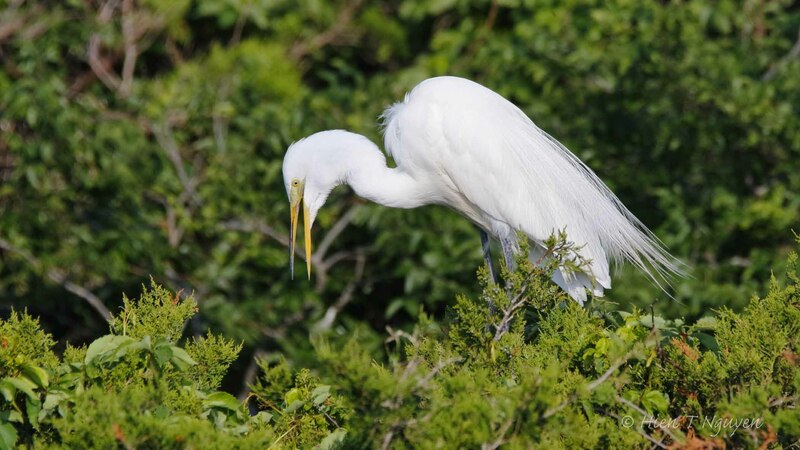 The rookery also had white egrets, both Great Egret and Snowy Egret, which added to my confusion. 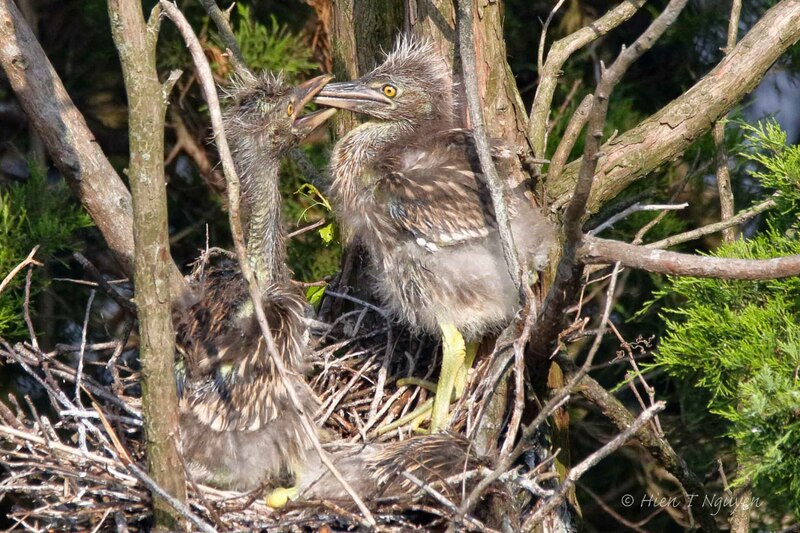 The one way I could be sure was when parent and juvenile were together, as when the parent brought food home for the hungry juvenile. 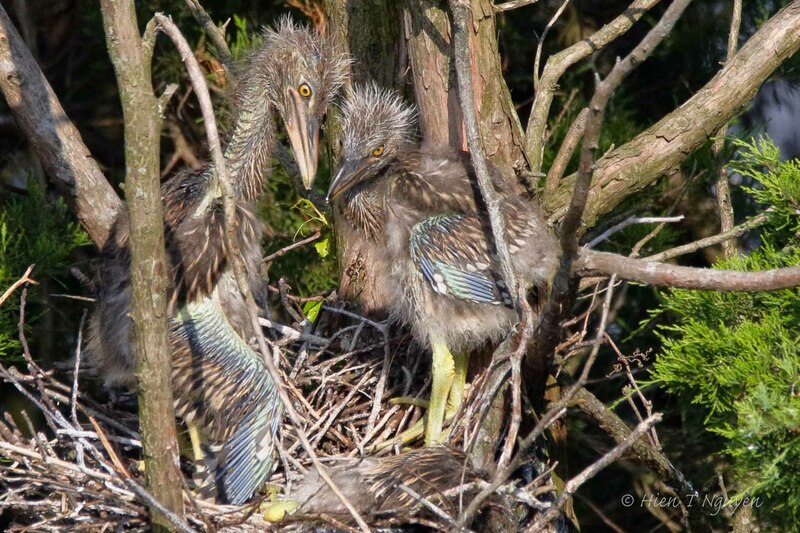 Little Blue Heron, parent and child. 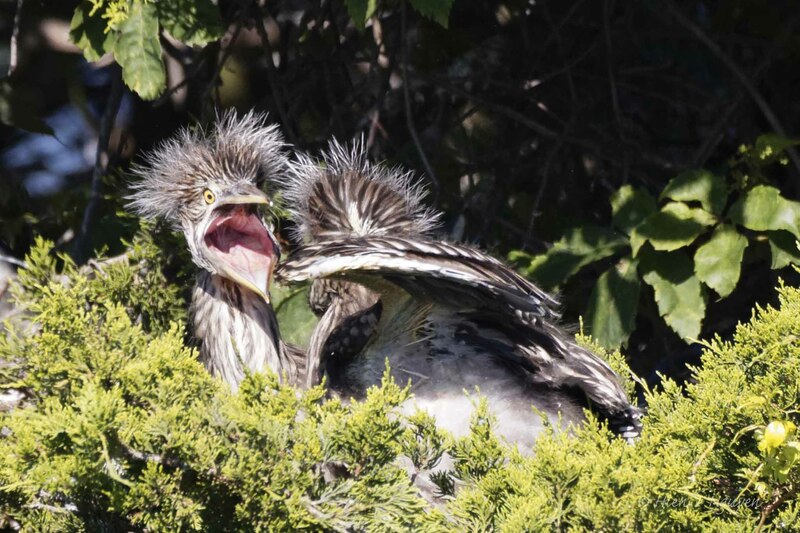 No more food. 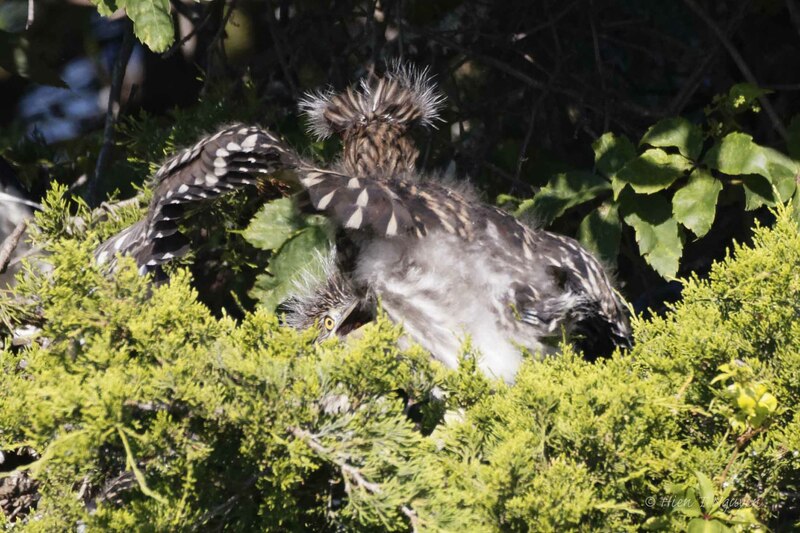 The parent tried to get away. 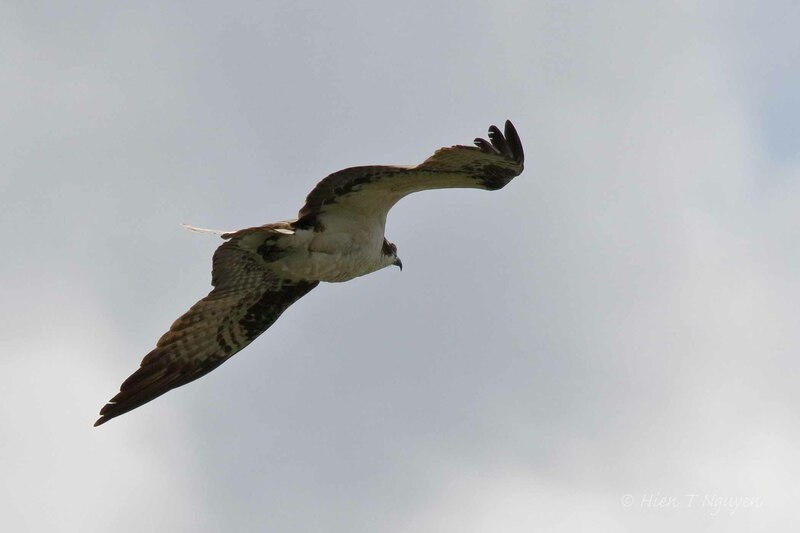 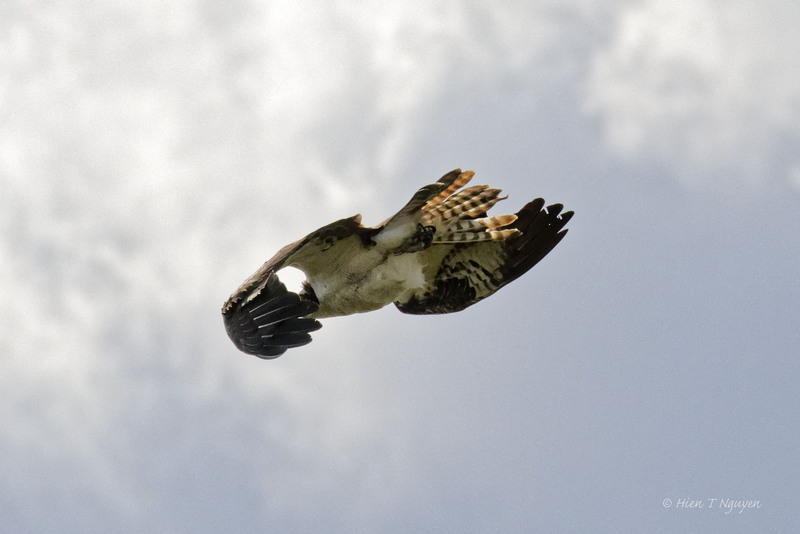 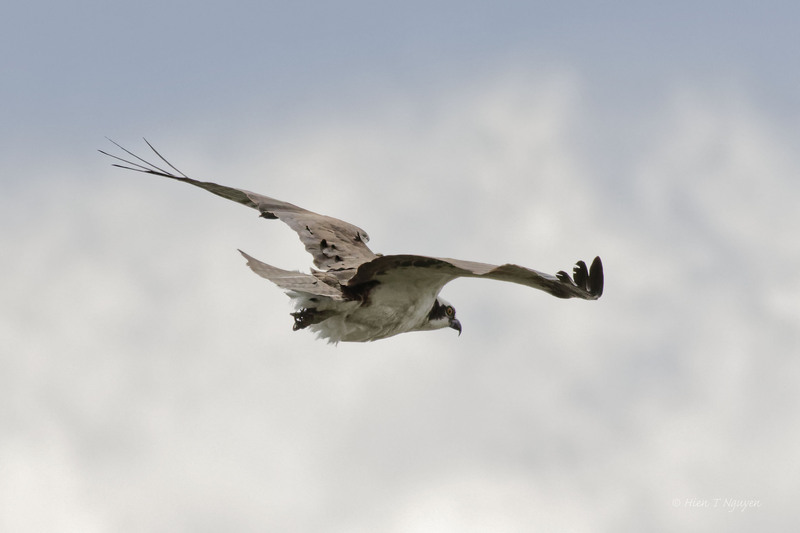 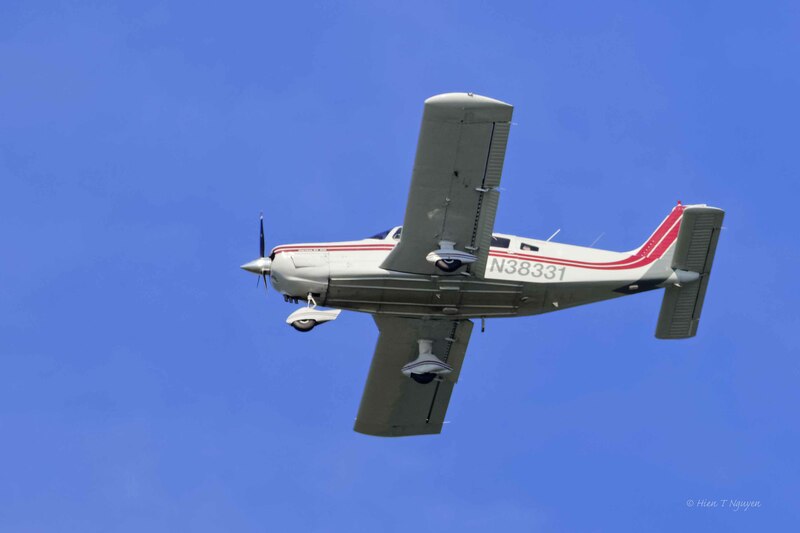 Parent flying away to get more food. 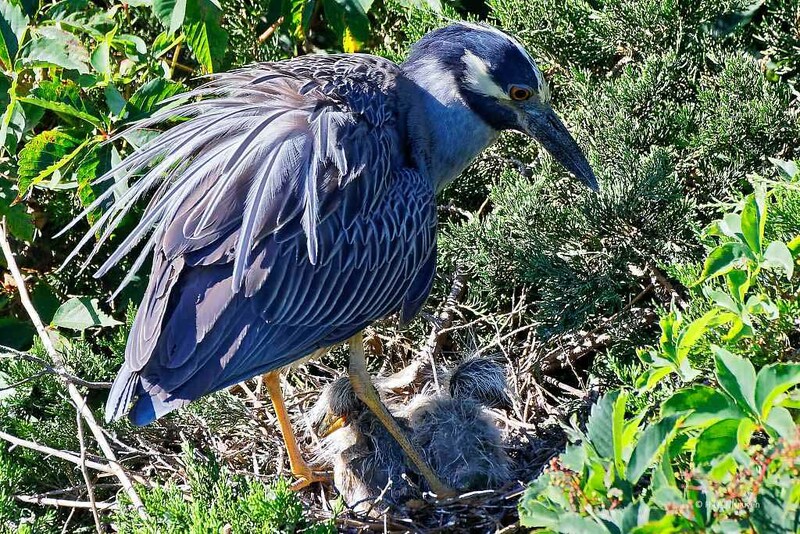 In the first post for this series 11 days ago, I posted pictures of a Yellow-crowned Night Heron tending to her five eggs. 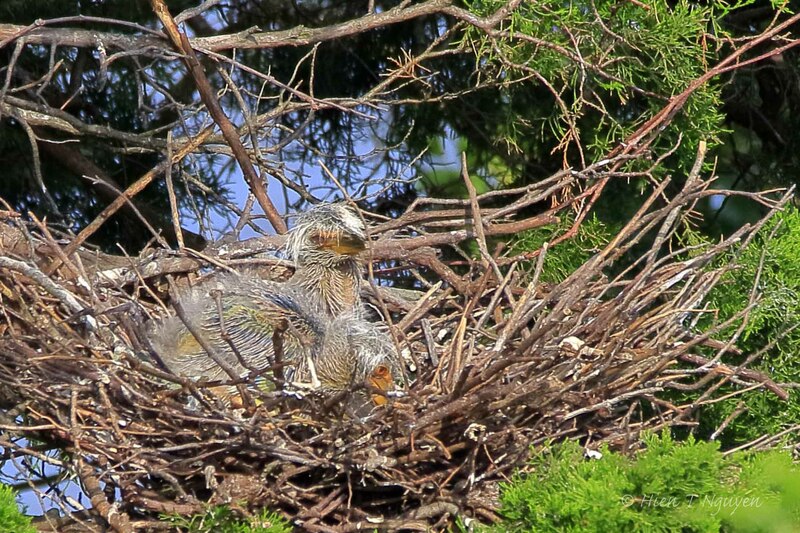 Yesterday, I went back there and saw that the eggs have become young chicks covered with down, barely able to stand up. 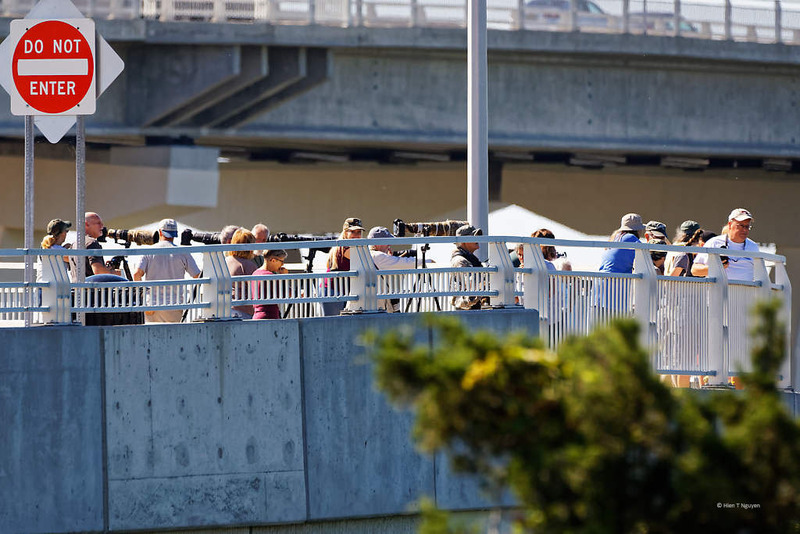 There were about twenty photographers gathered on the sidewalk above the nest, all vying to take pictures of the herons. 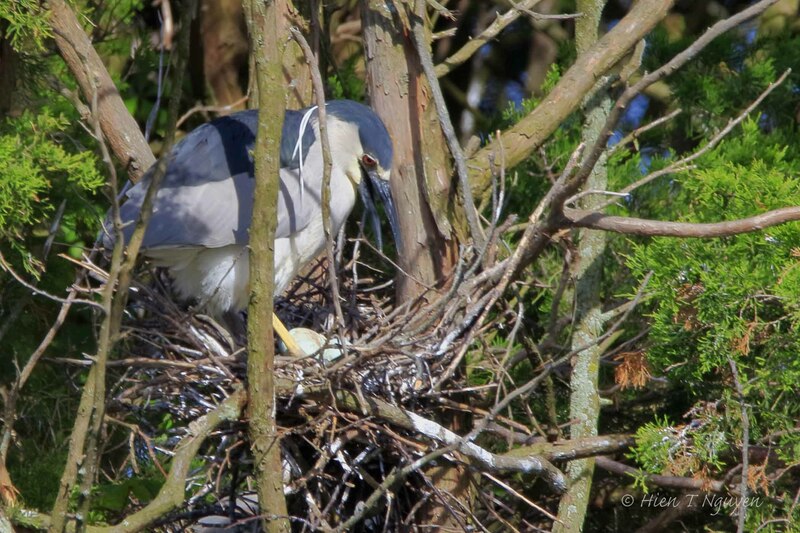 As I got there, the male heron had just landed with a twig in his beak. 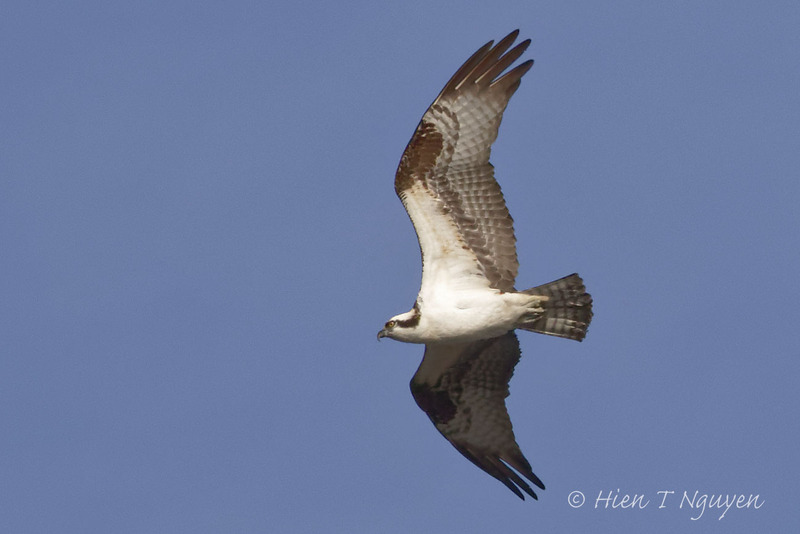 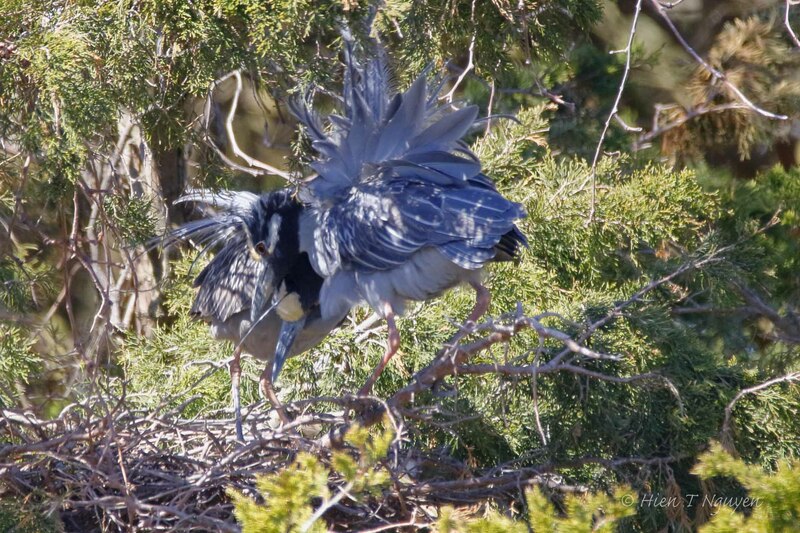 The female will take it and add it to the nest. 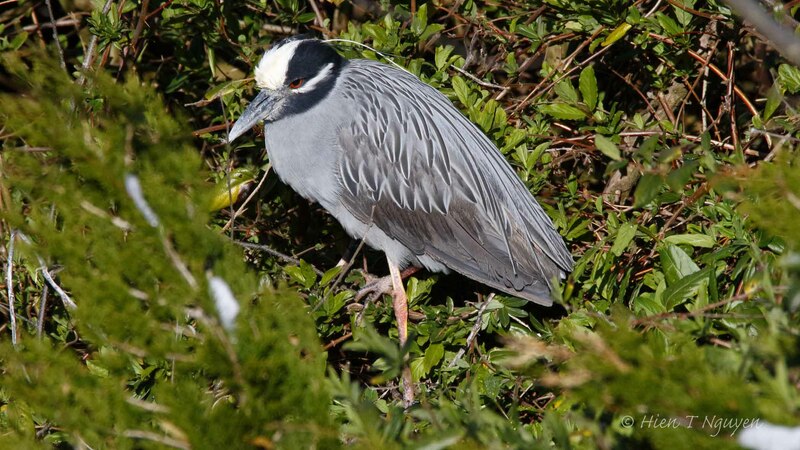 Yellow-crowned Night Heron arriving with twig. 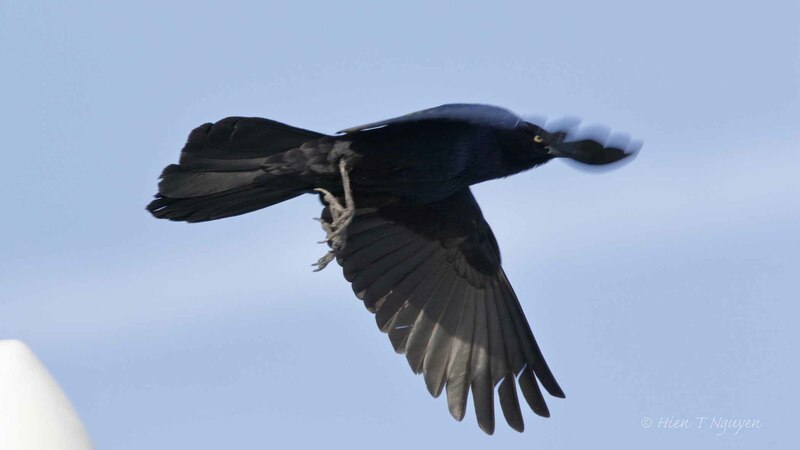 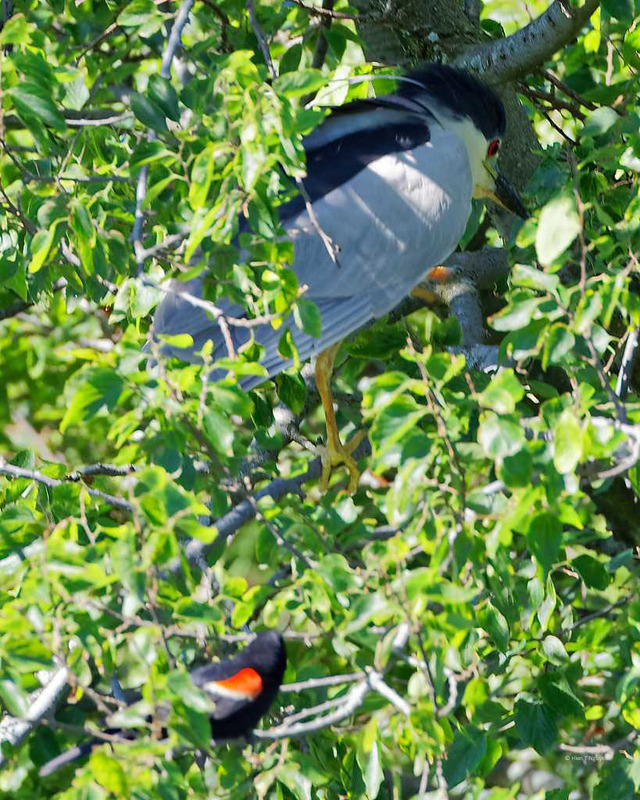 Female taking twig from male. 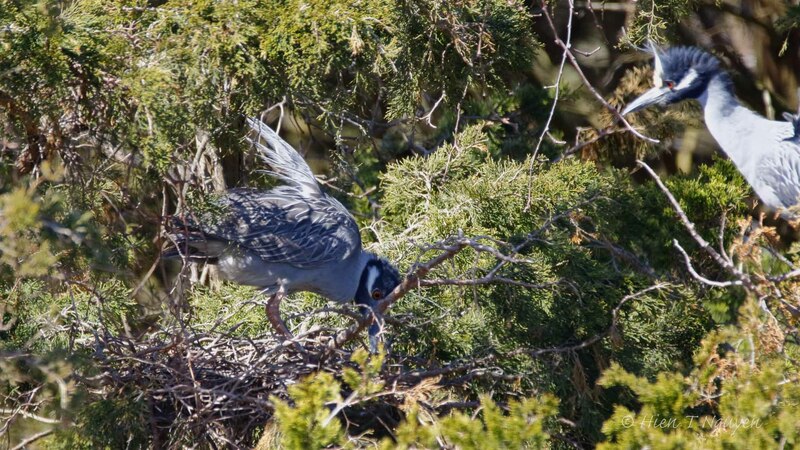 Female adding twig to nest. 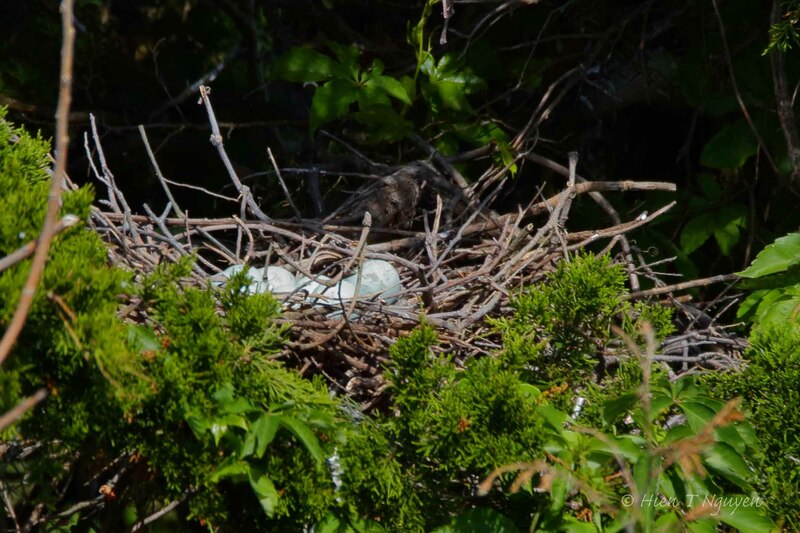 There were five eggs, but I only see three chicks. 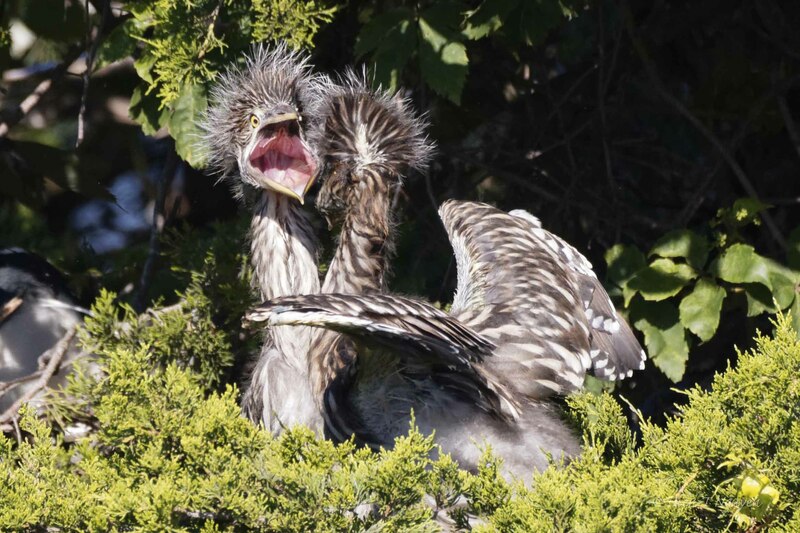 I wonder what happened. 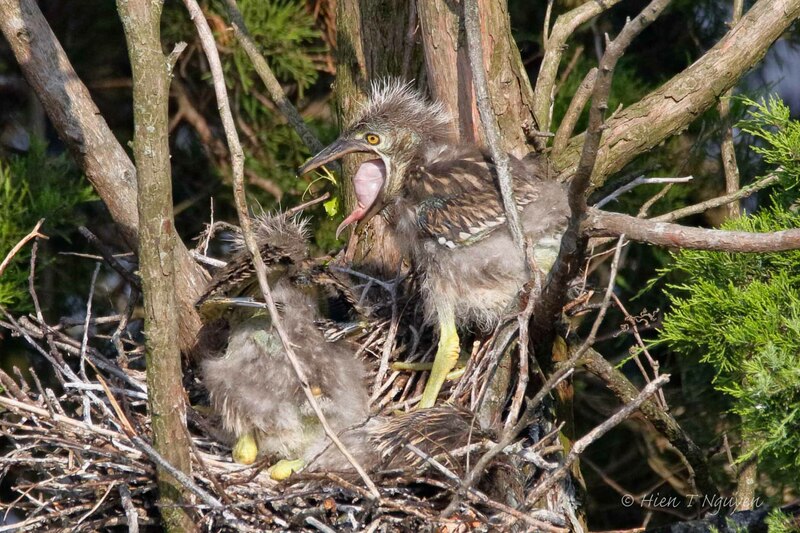 Mother heron proceeded to feed the chicks. 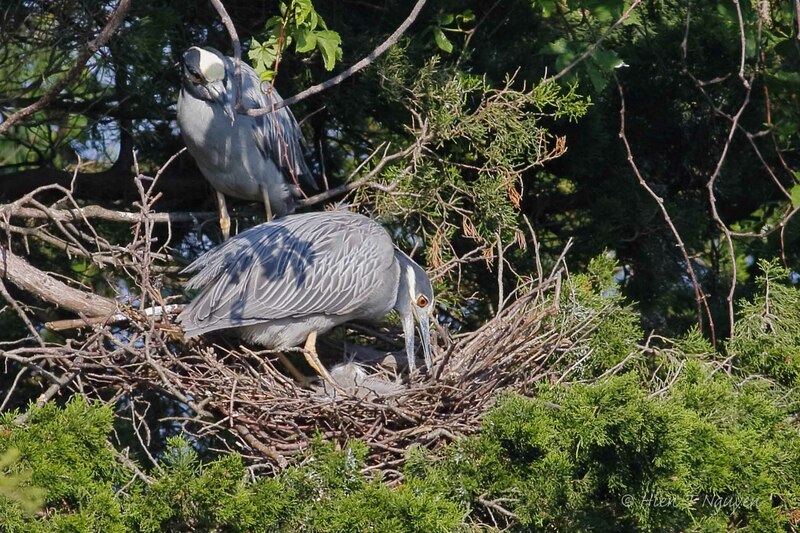 Afterwards, she spread out her wings to shield her children from the hot sun. 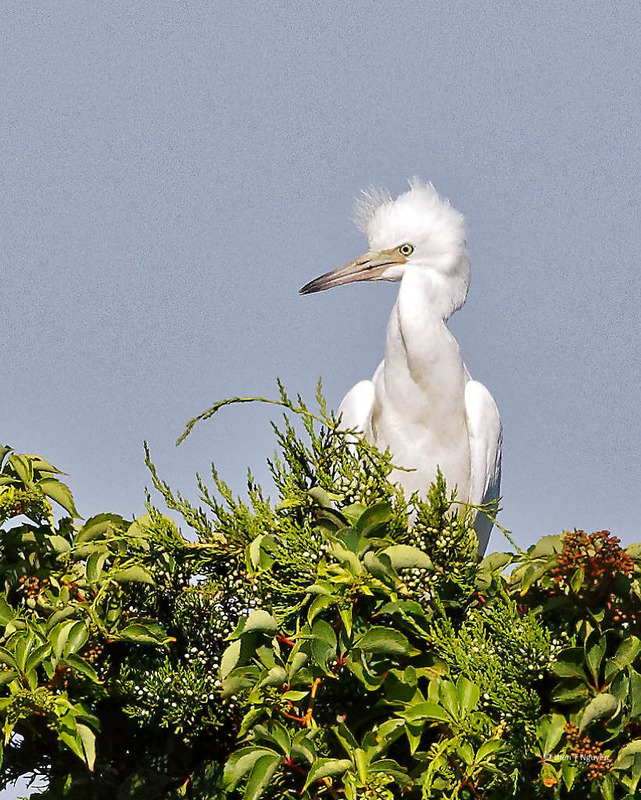 She kept her eyes closed, perhaps taking a well-deserved nap. 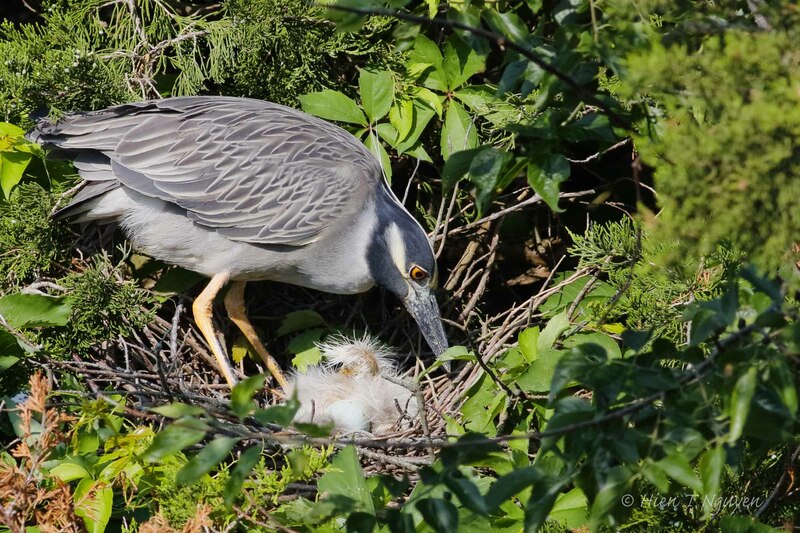 Female shielding chicks from sun. 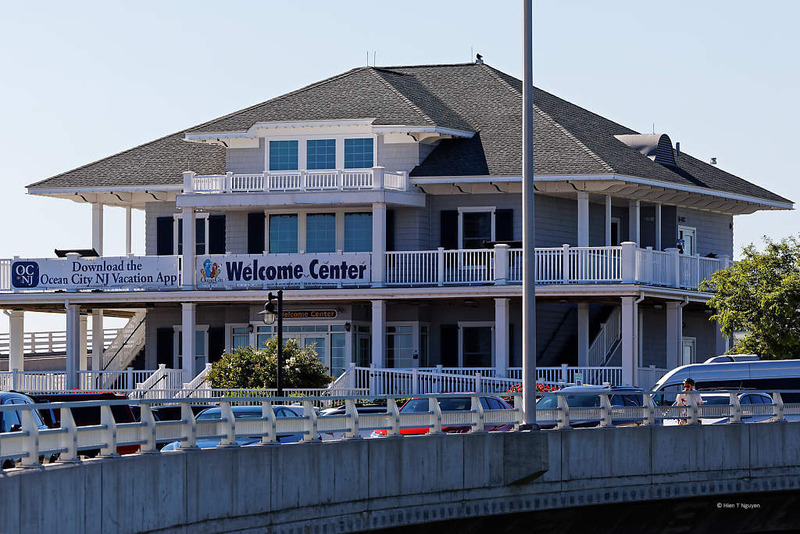 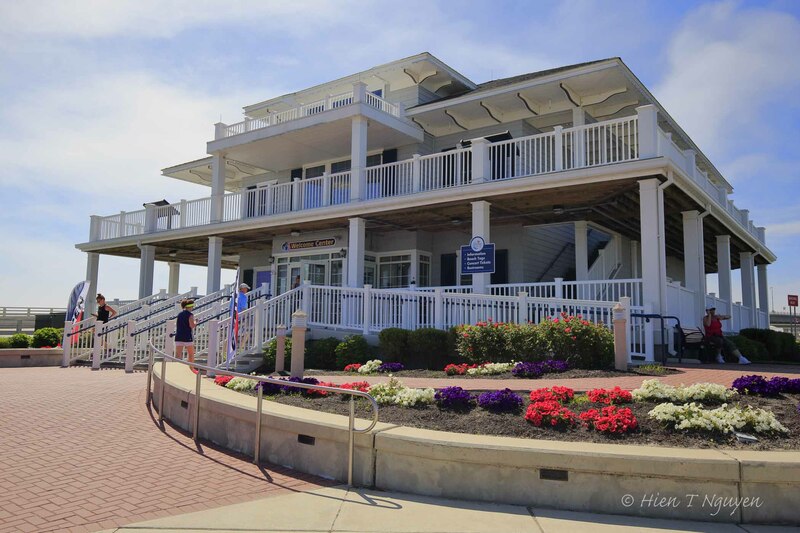 Following are pictures of the Ocean City Welcome Center and the bird paparazzi. 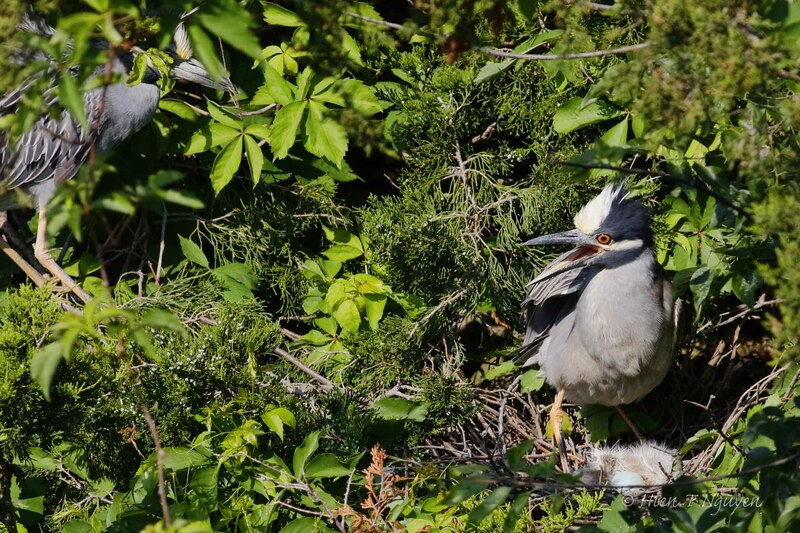 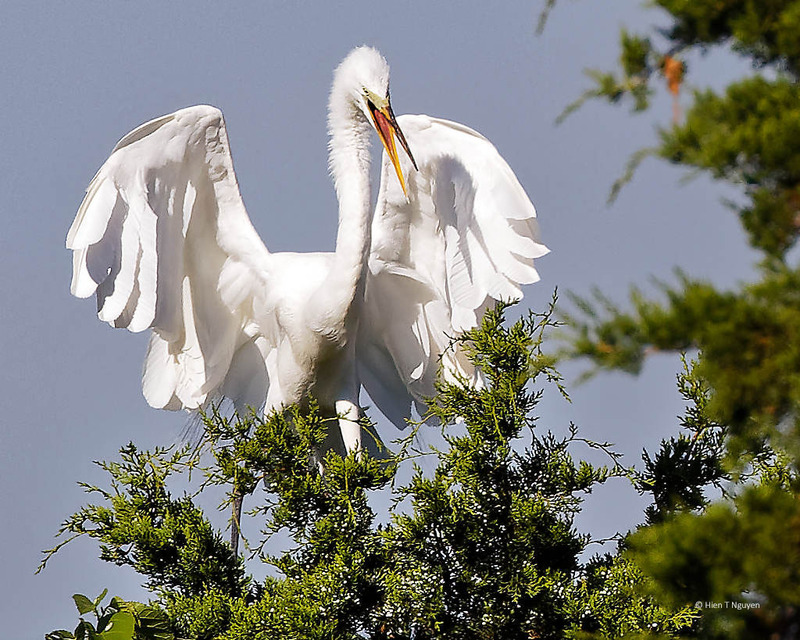 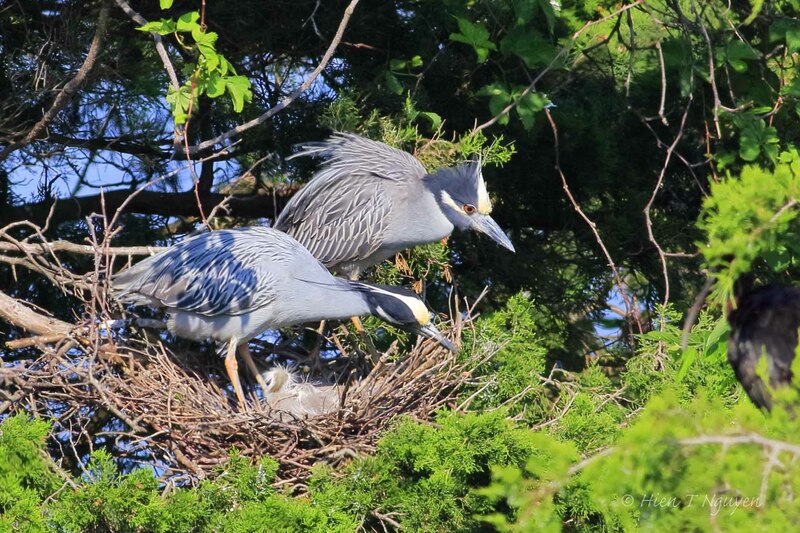 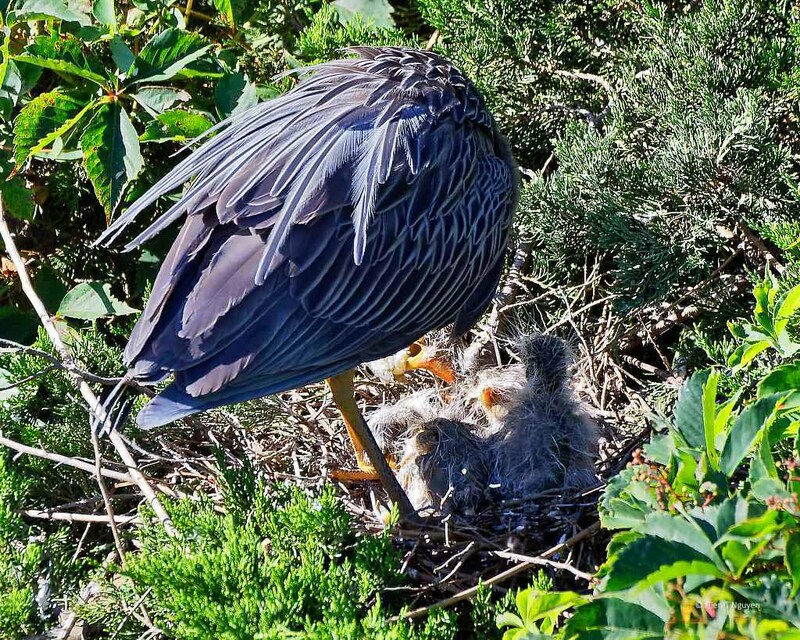 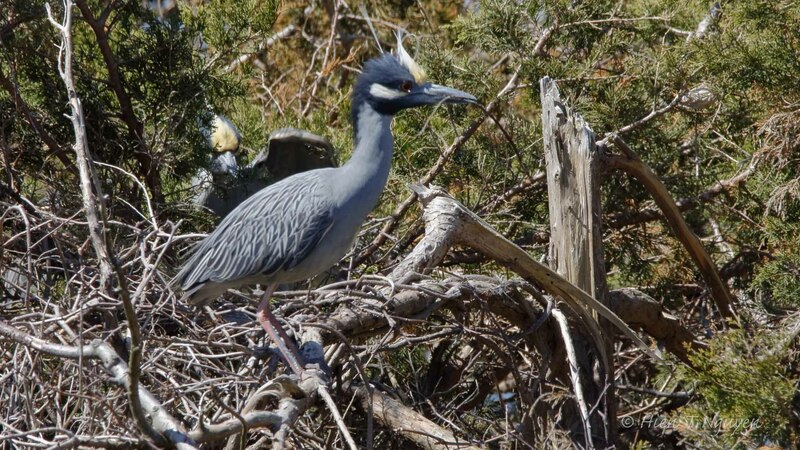 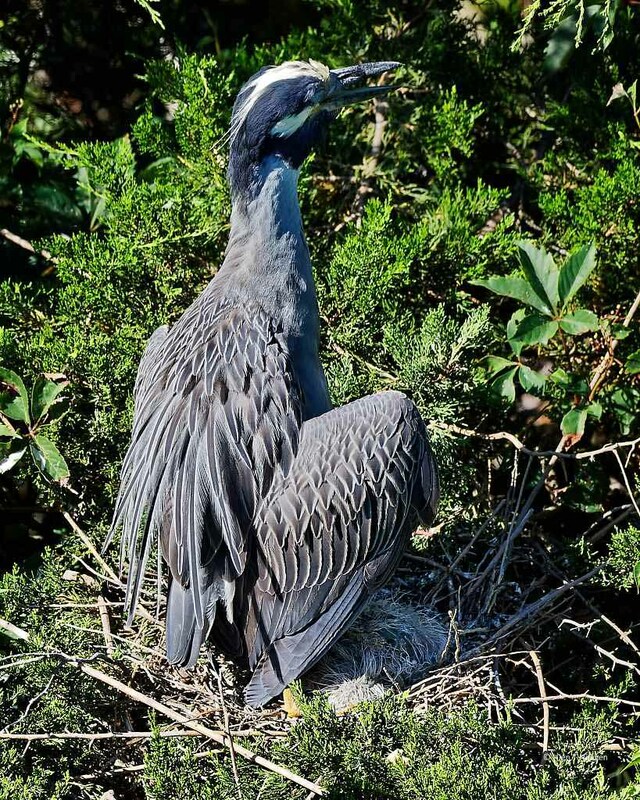 Yesterday at the rookery next to Ocean City Welcome Center I took many pictures of heron nests and their occupants, as well as of other birds flying and nesting in the area. 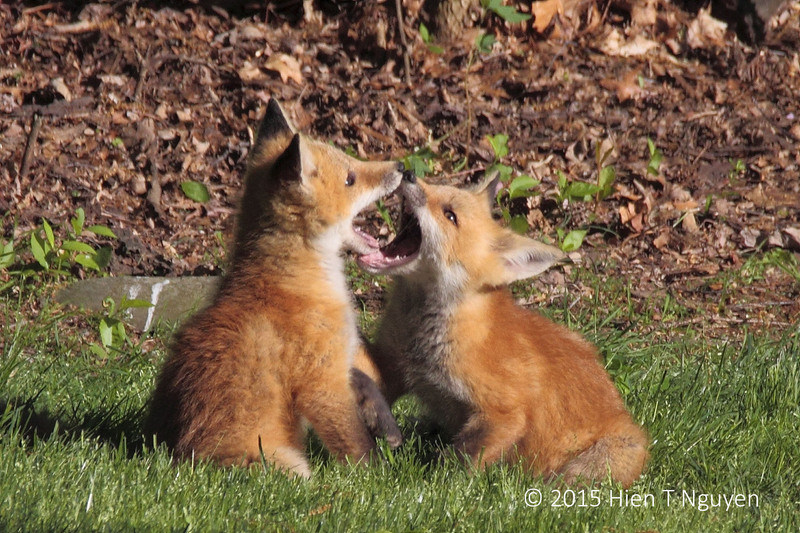 However, I think you may enjoy looking at the ones below, which offer a unique perspective on sibling rivalry. 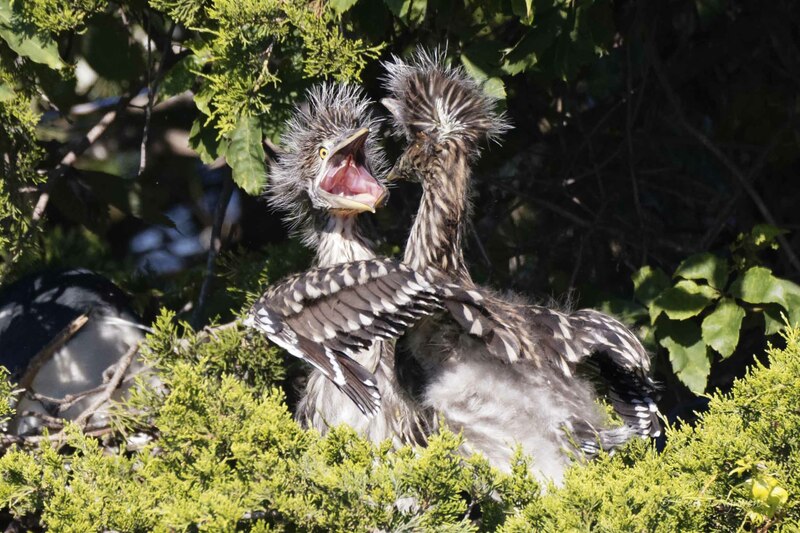 A pair of young Yellow-crowned Night Heron, they have grown up quite a bit since last week, were confronting each other, and the facial expressions of one of them are priceless. 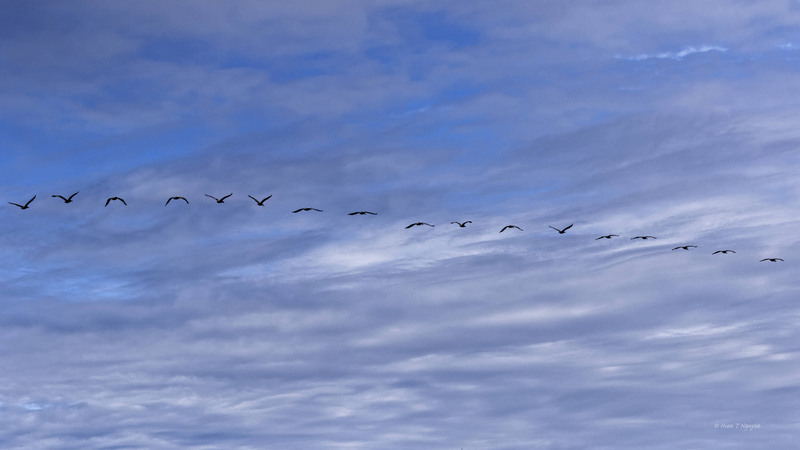 The above reminds me of another photo I took last year, at around this same time. 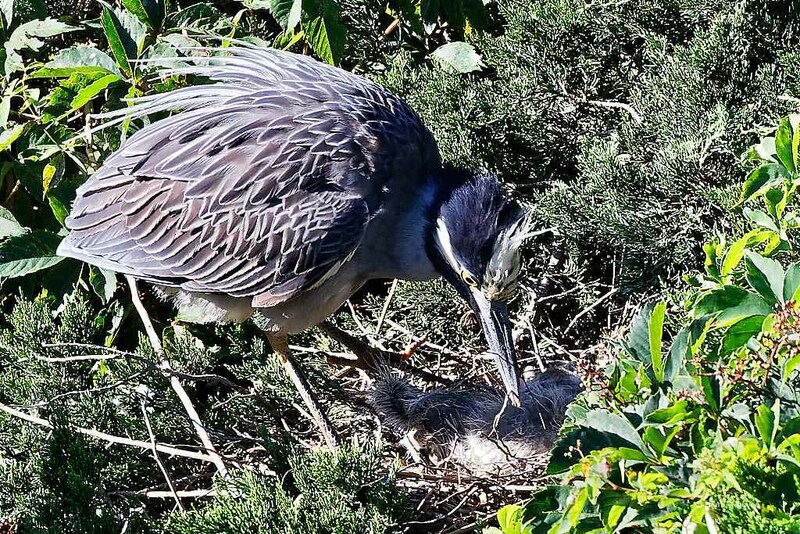 Yesterday was the first time I used my camera to shoot a short video of a Yellow-crowned Night Heron tending to its babies in their nest. 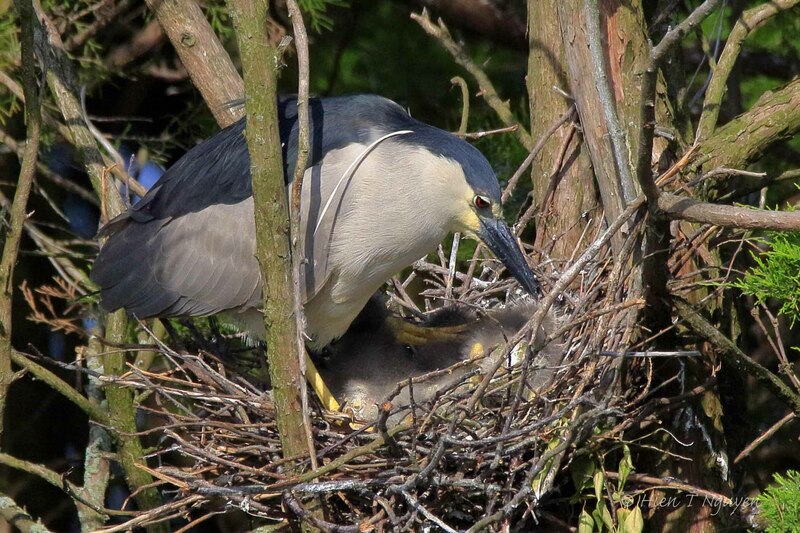 It is a little noisy, but here it is anyway so that you can see the interaction between mother and babies. 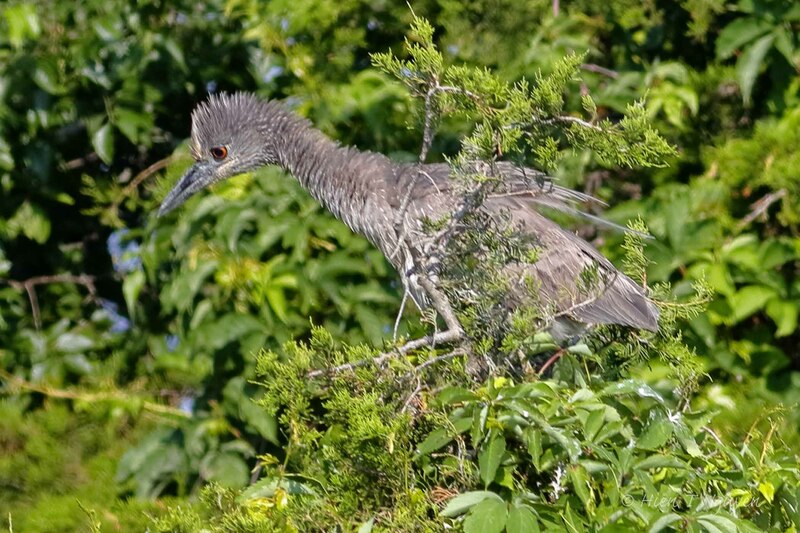 Going through my files from yesterday, I found one of an immature heron, probably a Black-crowned Night Heron. 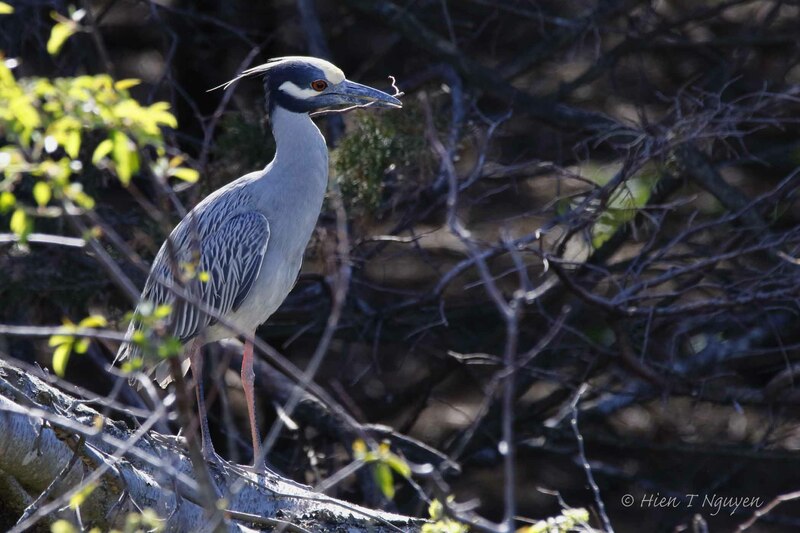 And here’s one of an adult heron carrying a twig. 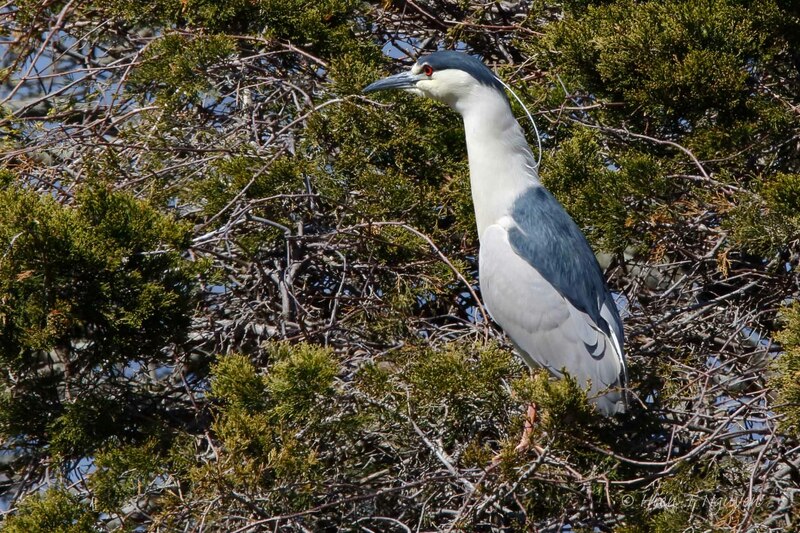 Last Sunday, as I watched the Night Herons at the Ocean City Welcome Center, I kept hearing loud noises as if someone was breaking branches. 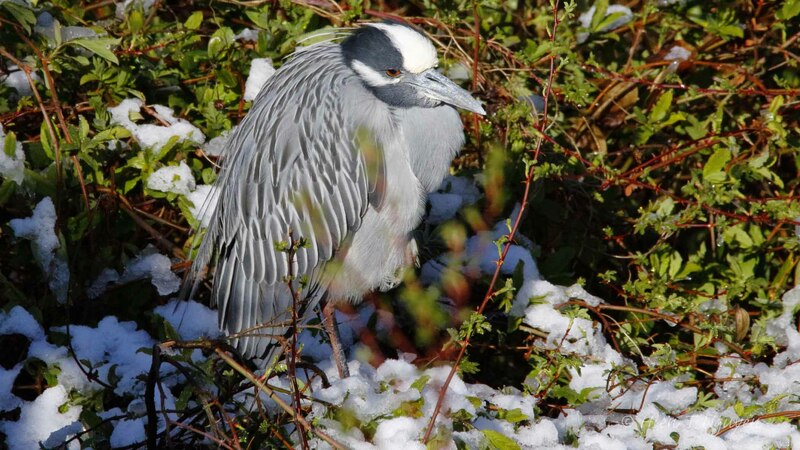 It turned out that it was the herons themselves. 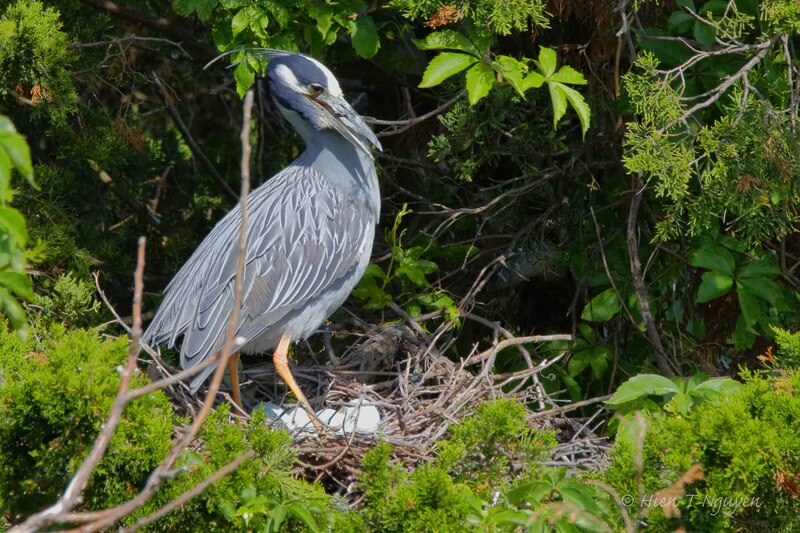 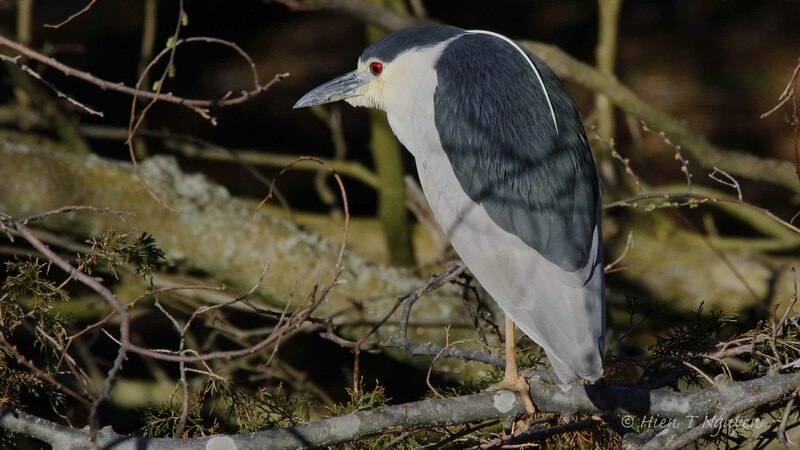 As you can see from the photo below, these herons have very sturdy, thick bills. 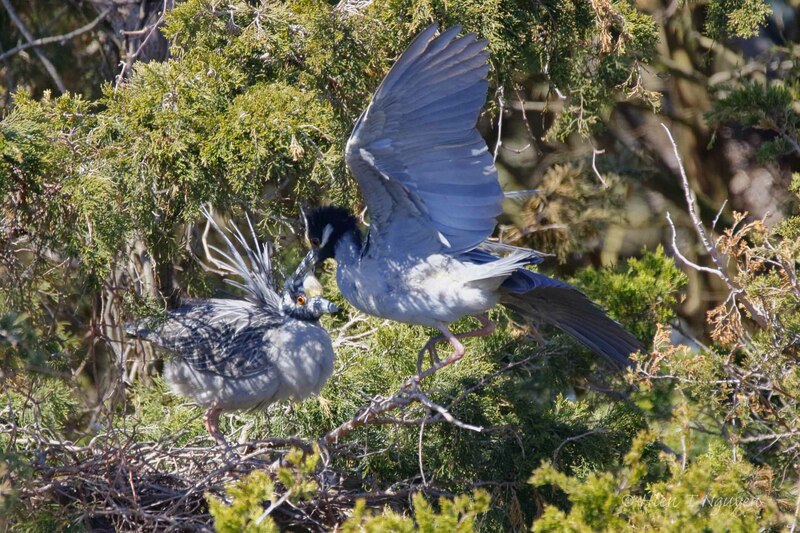 In fact, they are known as crab eaters, eating whole crabs by crushing them with their bills before swallowing them. 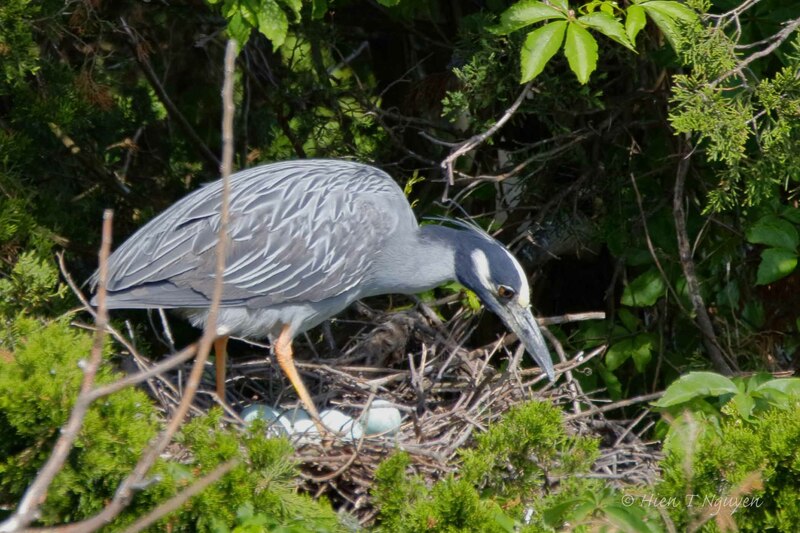 With larger crabs, they grab them with their bill and then shake them violently to break them up into smaller pieces. 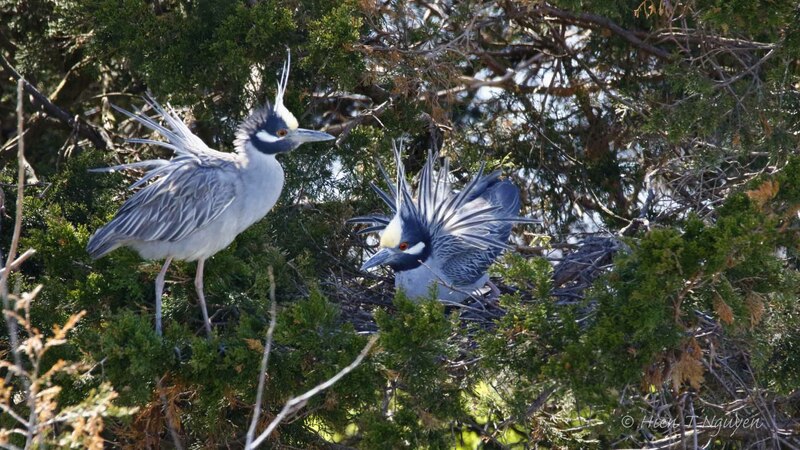 Their bills are like those steel crab crackers that they have at restaurants that serve crabs. 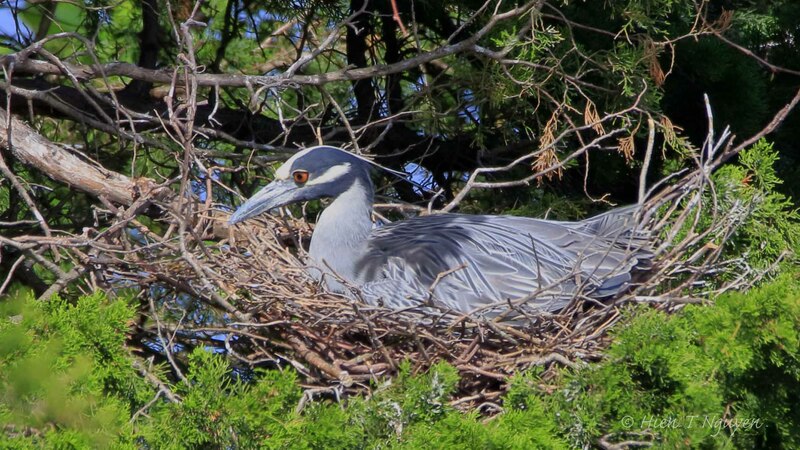 A the start of breeding season, the herons have to build nests where the females will lay their eggs. 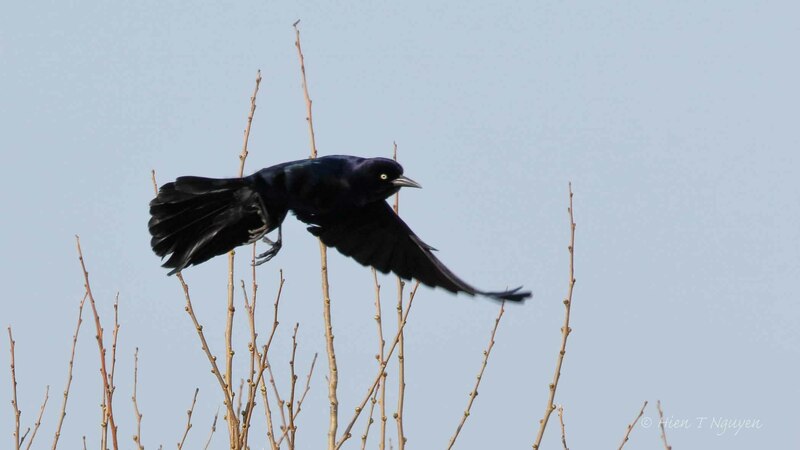 They go around their neighborhood and use their bills to break dead branches and bring the pieces back to their nests. 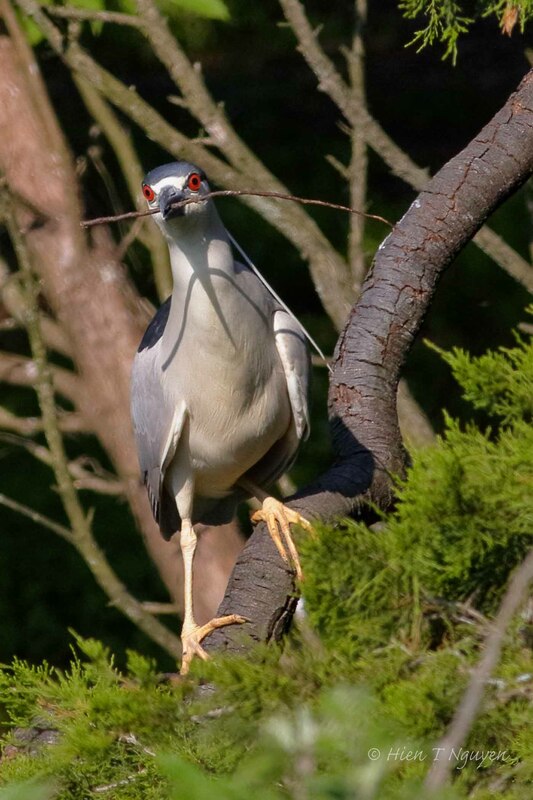 Heron seized branch with bill. 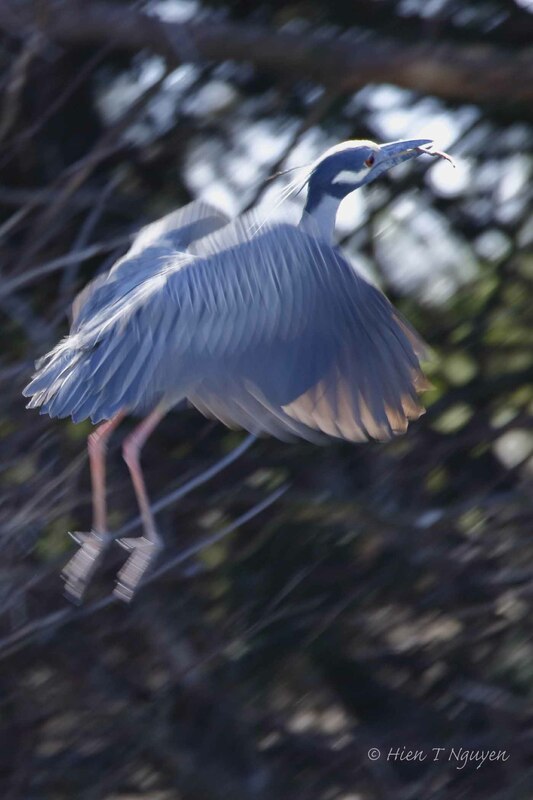 Heron jumping up and down to break branch. 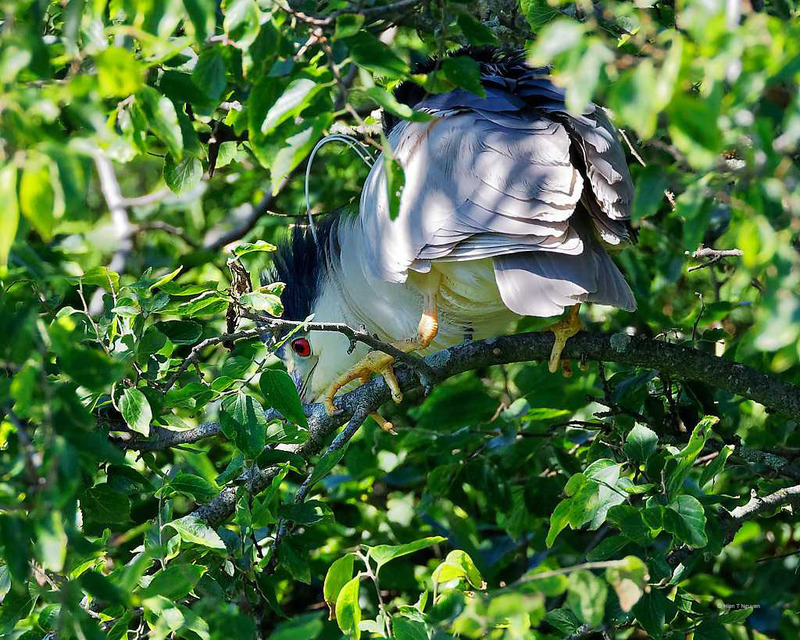 Back to nest with broken branch. 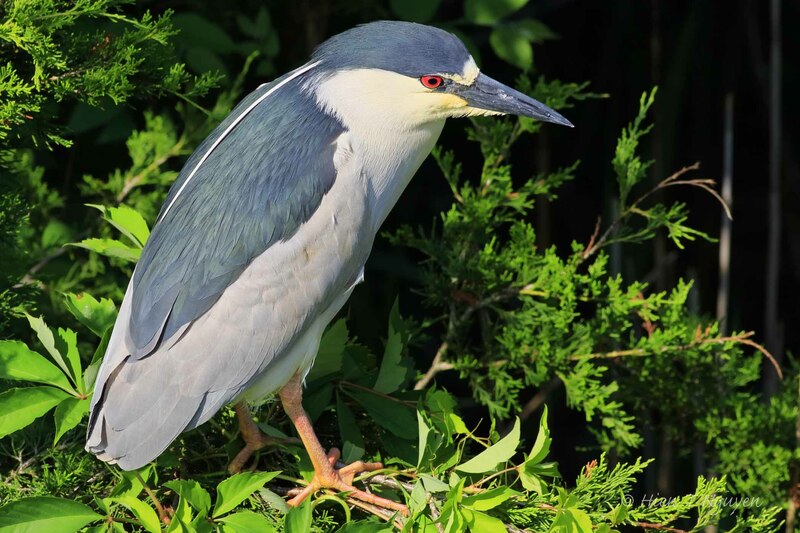 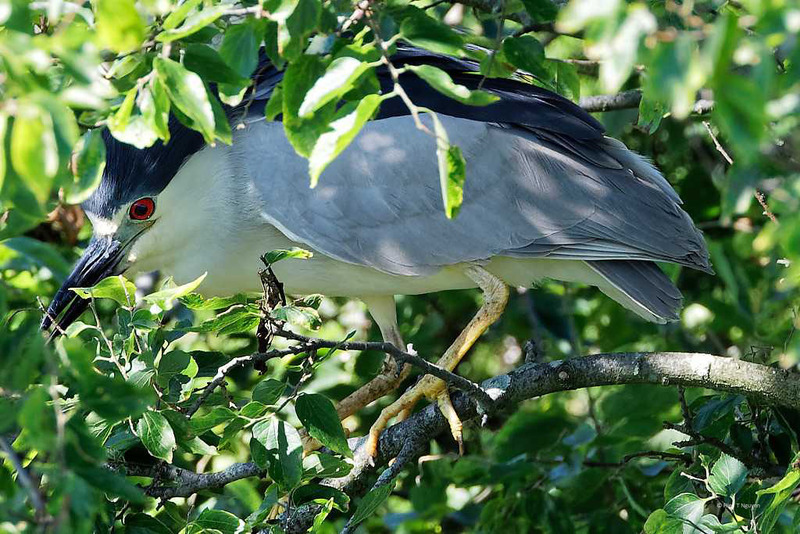 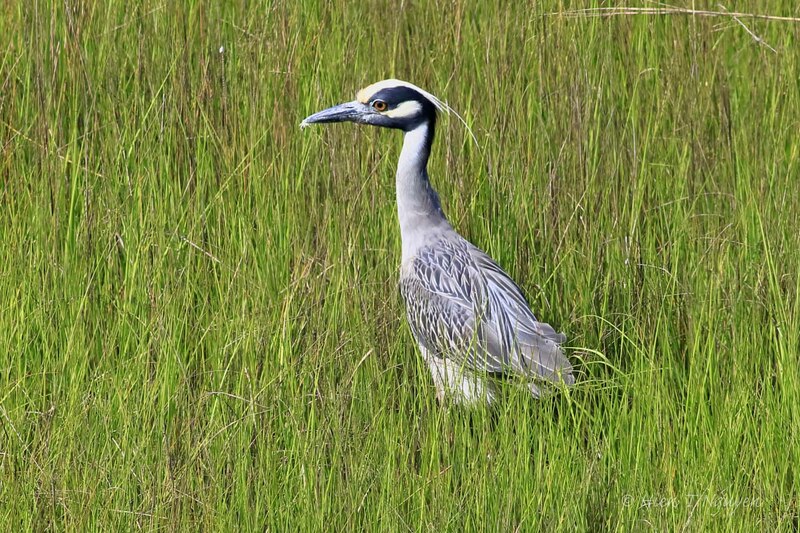 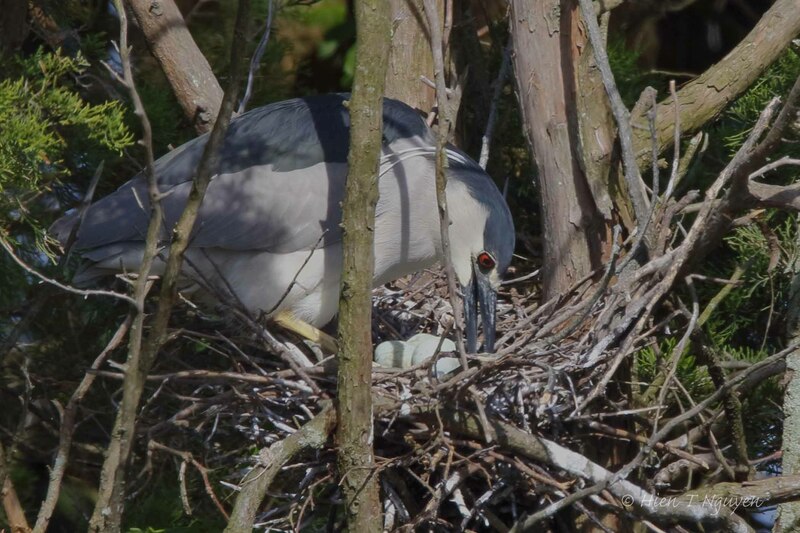 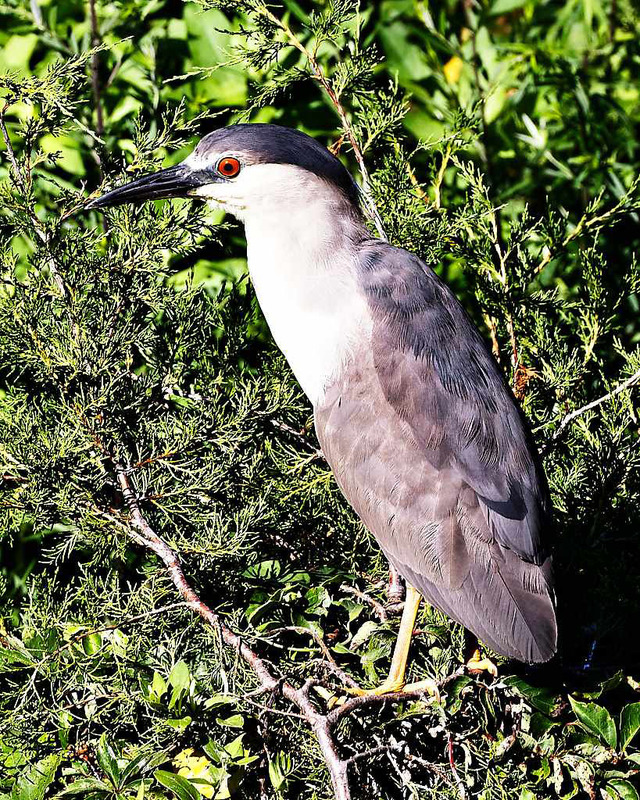 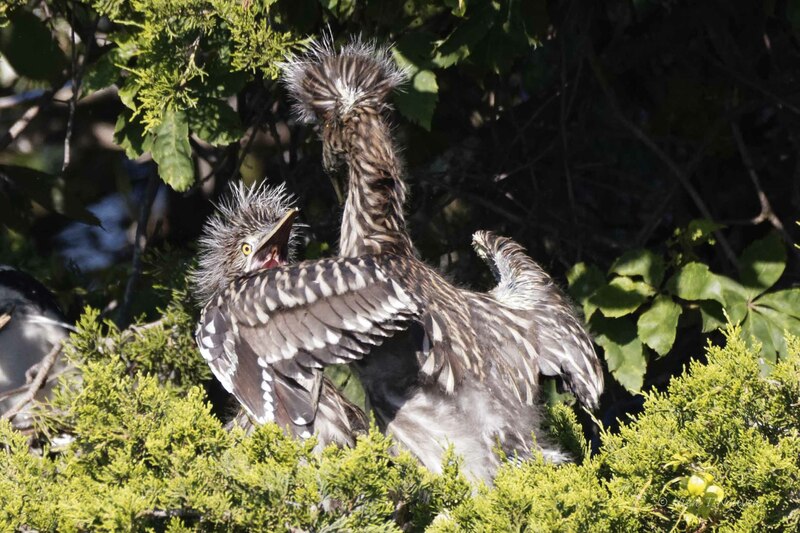 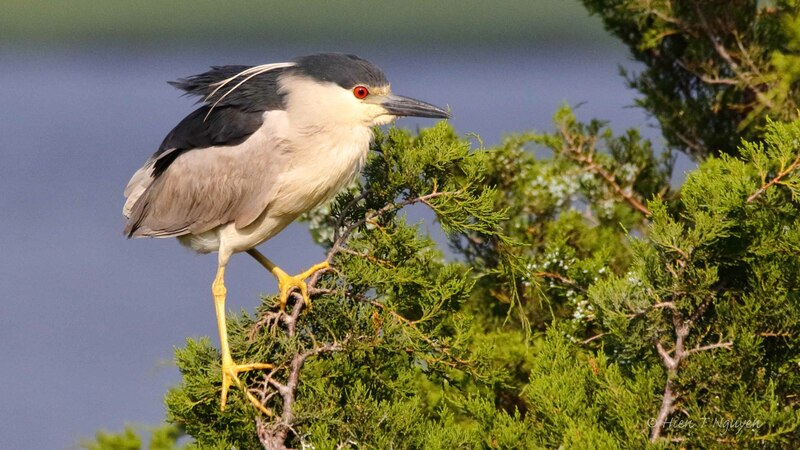 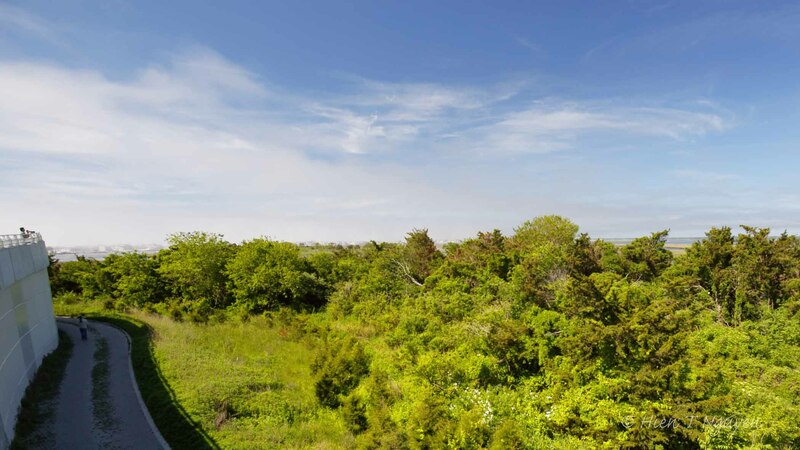 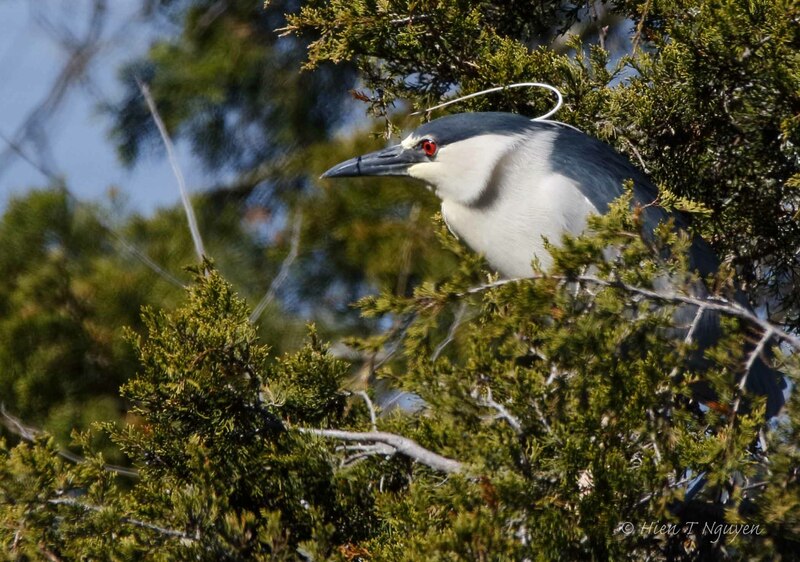 The Welcome Center in Ocean City, NJ is right next to a rookery with many kinds of birds, including Yellow-crowned Night Herons. 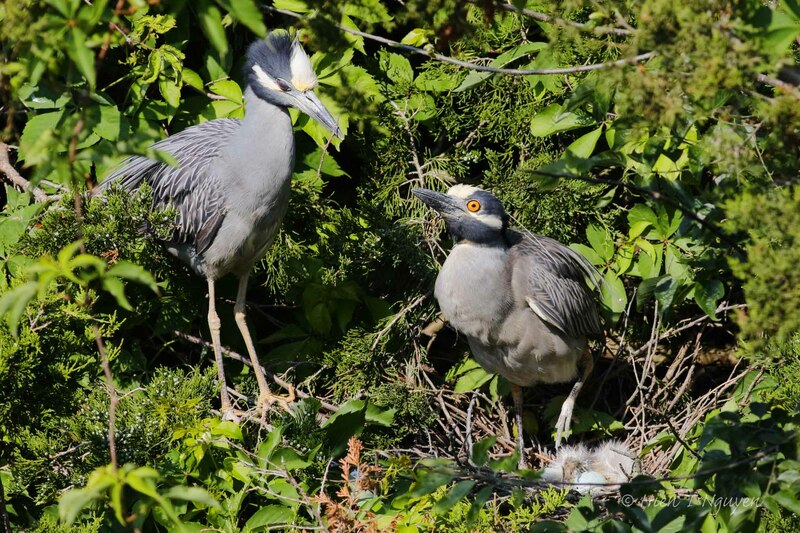 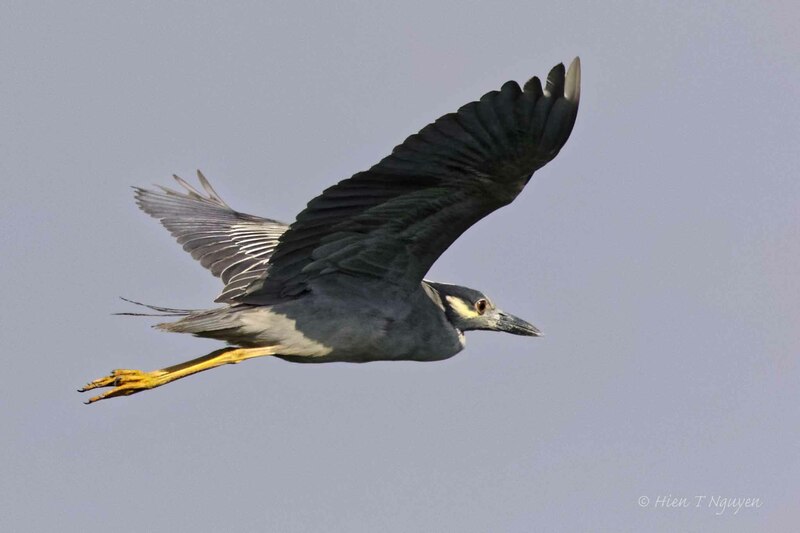 These herons are active during daylight hours, in contrast to the Black-crowned Night Heron that are nocturnal. 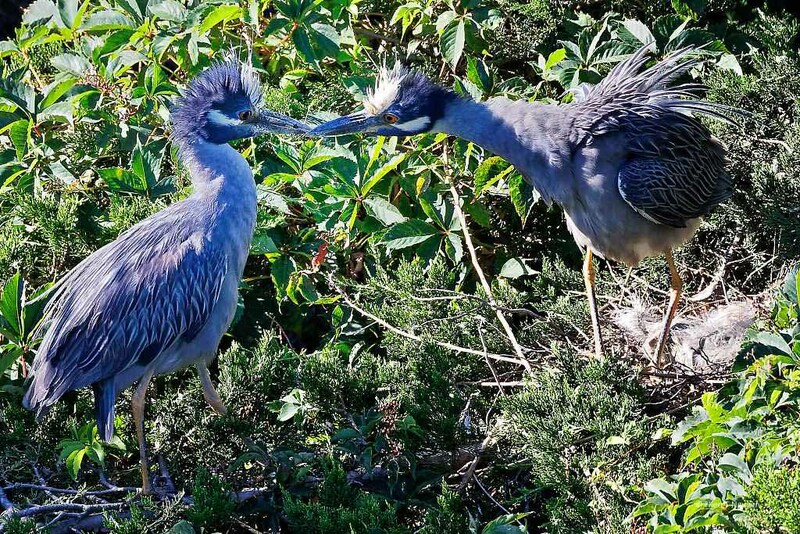 The herons arrived a little over two weeks ago, but within a week they had been busy courting, choosing their partners, and building nests. 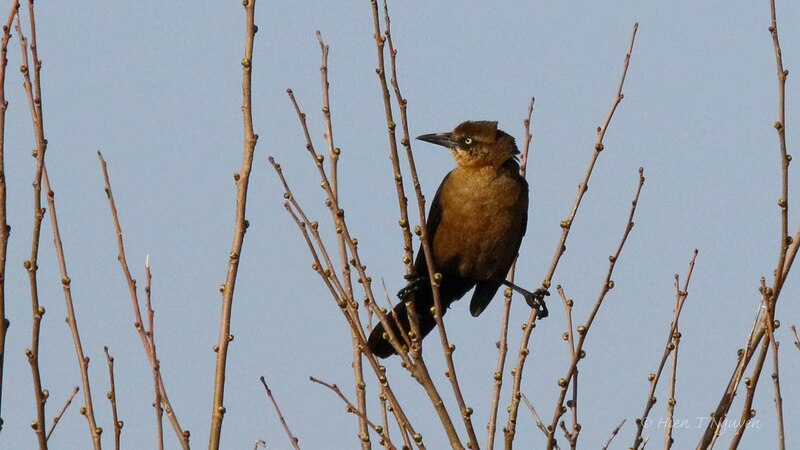 I took the following photos last Sunday. 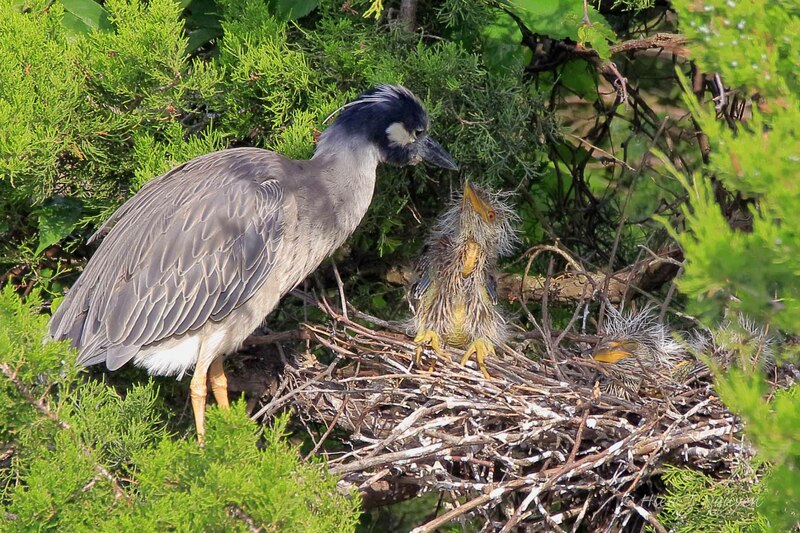 Yellow-crowned Night Heron standing next to a nest, thinking about what else could be added to it. 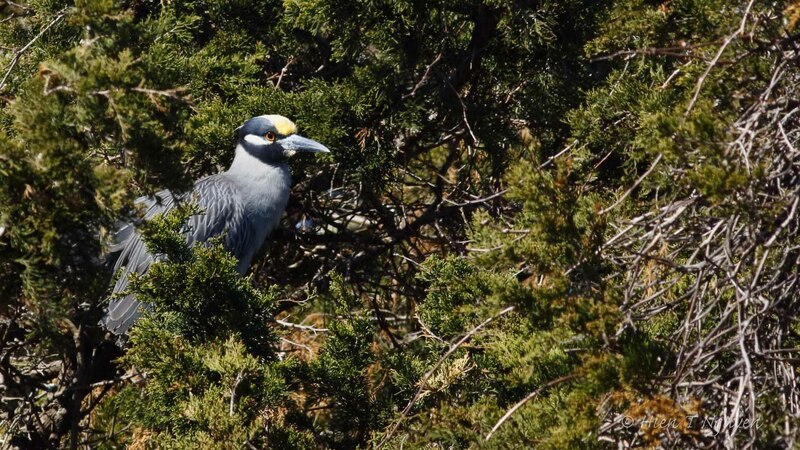 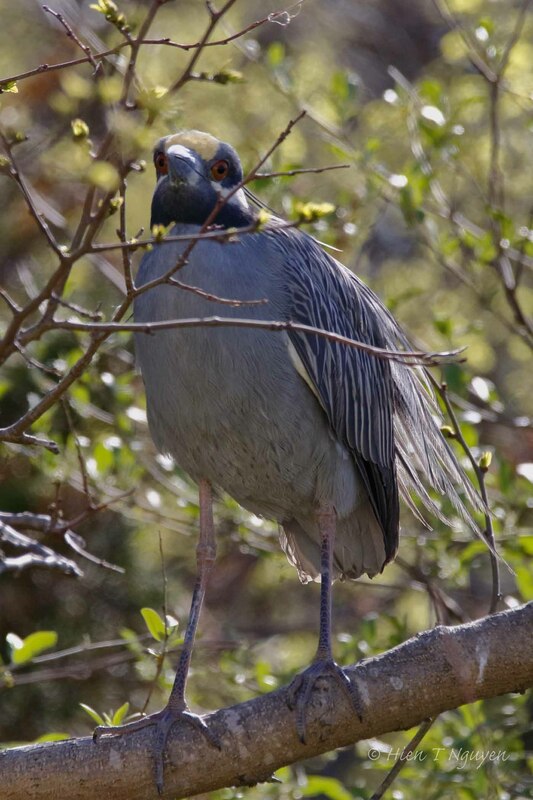 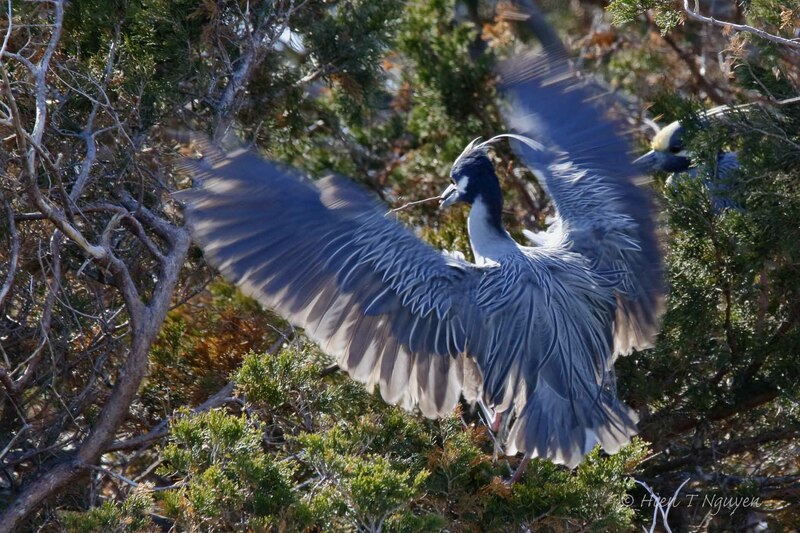 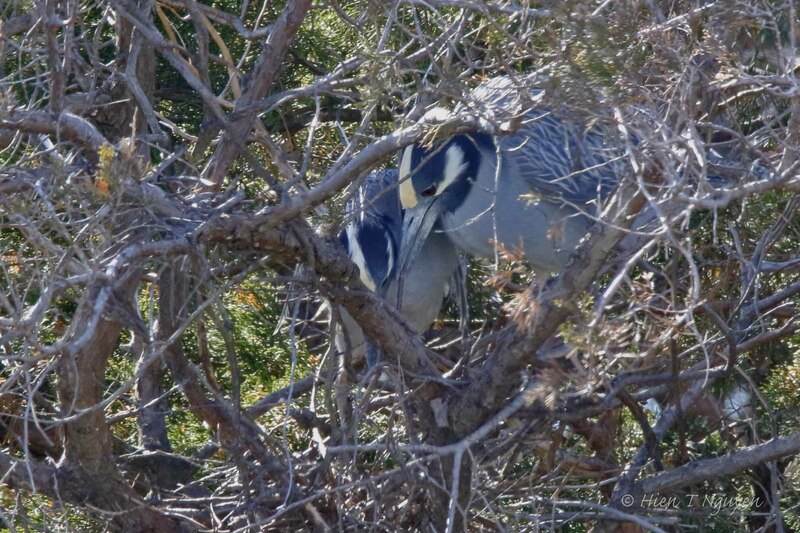 As a female Yellow-crowned Night Heron works on her nest, a male approaches. 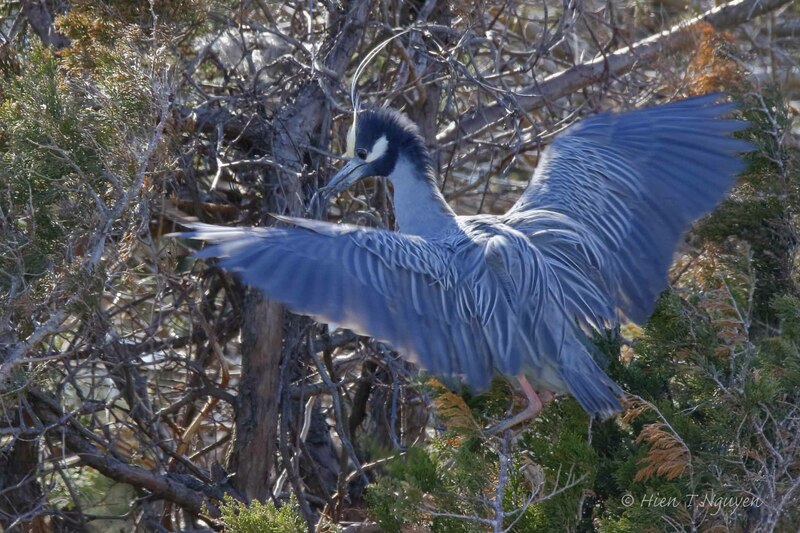 He tried to impress her with a display of feathers. 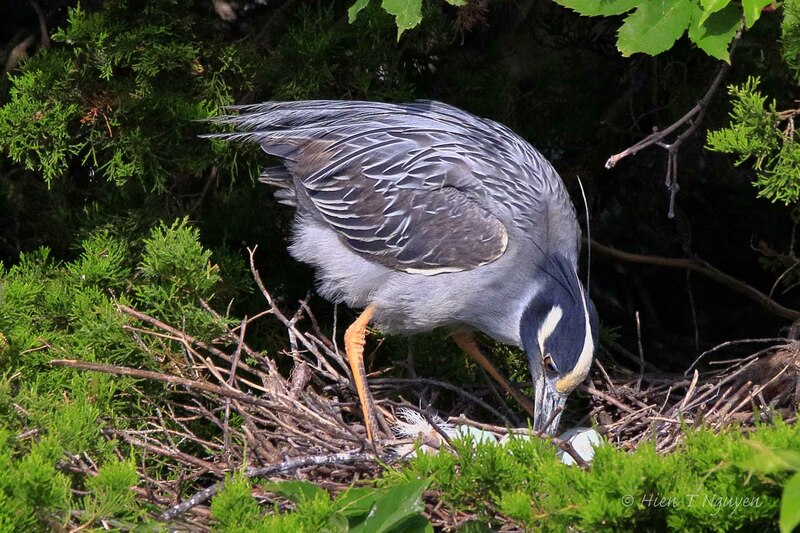 At another nest, a male Yellow-crowned Night Heron brought a branch to add to the nest. 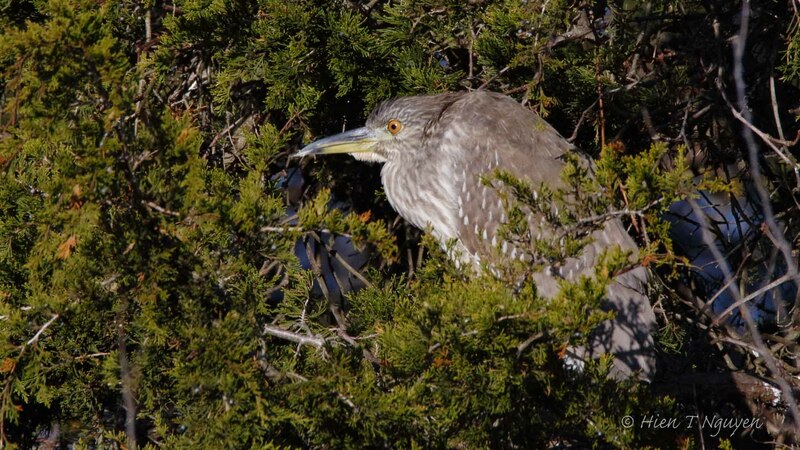 Meanwhile the Black-crowned Night Herons were starting to wake up. 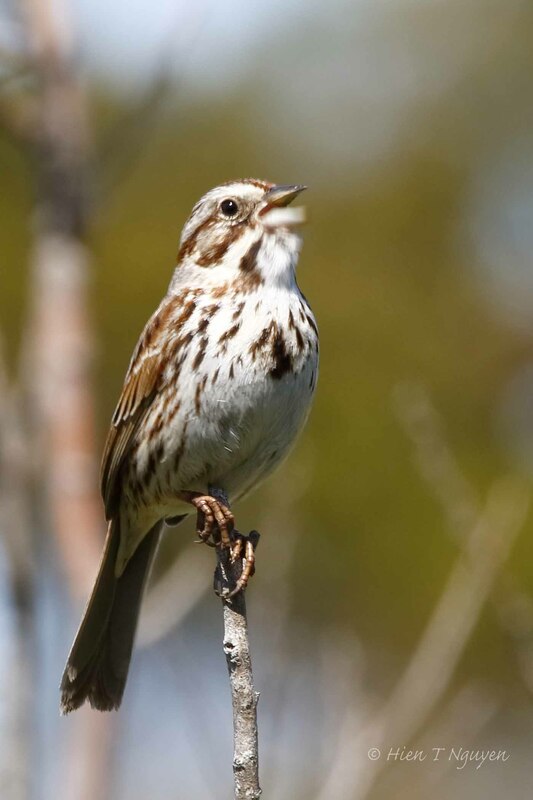 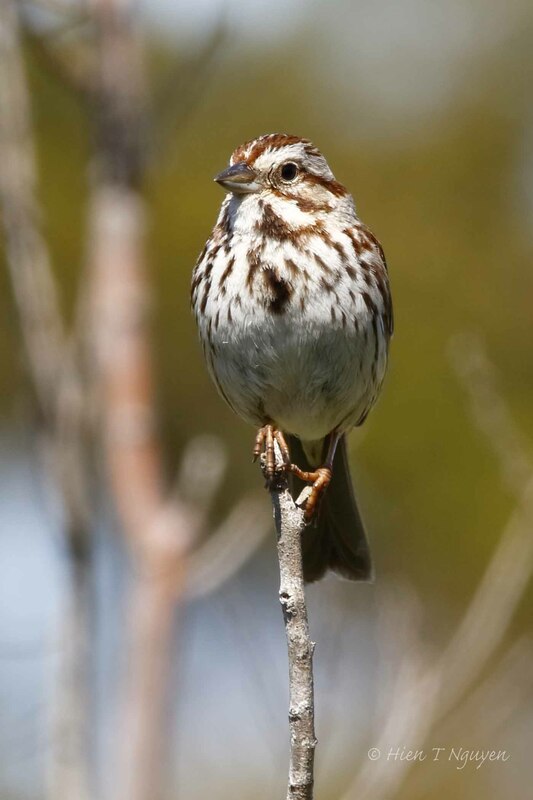 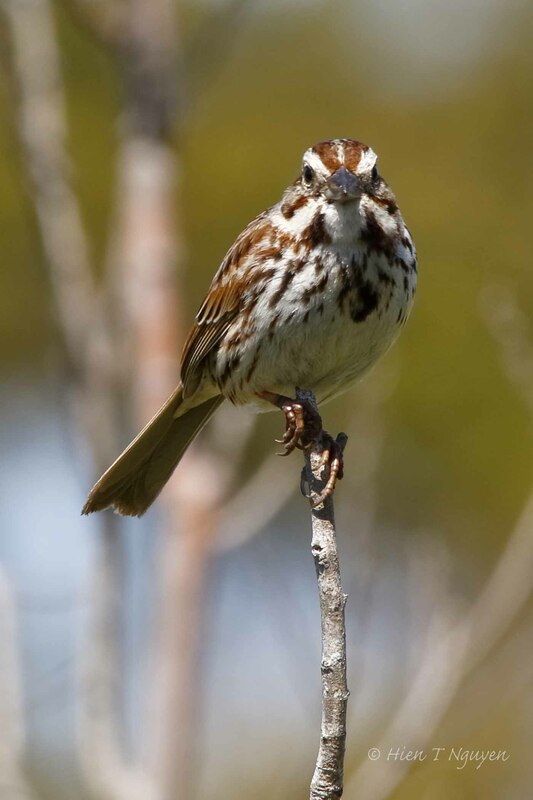 This morning, I saw a Song Sparrow perched on the top branch of a bush near the Ocean City Welcome Center.